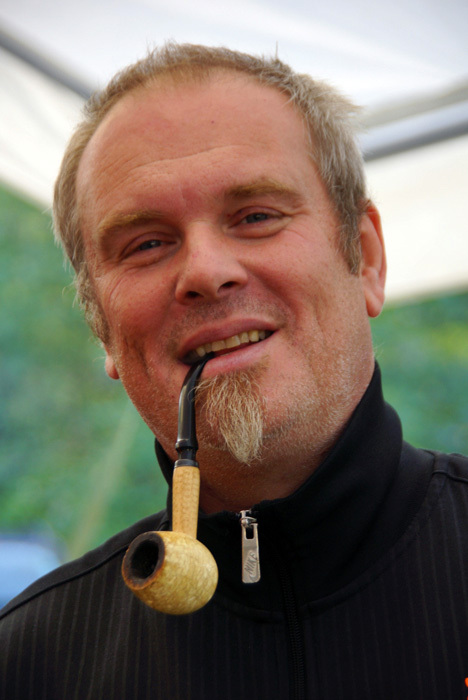 Jan (nickname “Janneman”) is a prominent member of the Dutch/Belgian pipe smokers forum. 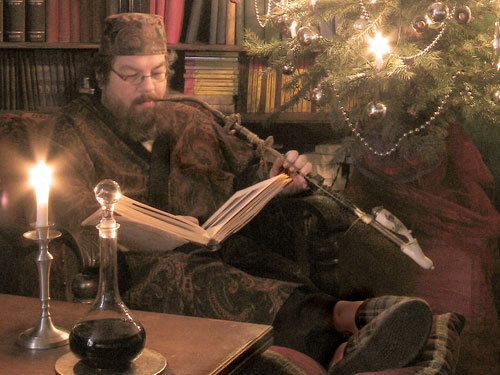 He is a walking pipe and tobacco encyclopaedia and many people started smoking pipe after seeing one of his movies or reading his Pijpenboek. Because of this one of the forum-tobaccos was named after him as a gesture to honour the good man. 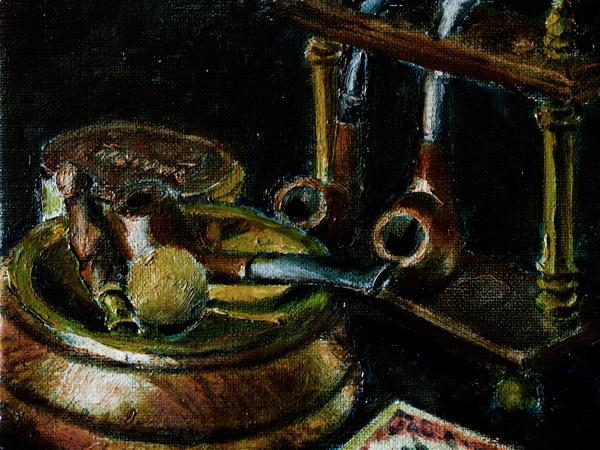 Throughout the years Jan made many beautiful, atmospheric and sometimes humoristic pictures and still lifes of himself smoking and of his pipes and tobaccos combined with other pleasures of life. For me these images have a certain nostalgic quality which never fails to ease my mind. Whenever I feel stressed out I look at one of Jan’s pictures and the burdens of the day fall from my shoulders. 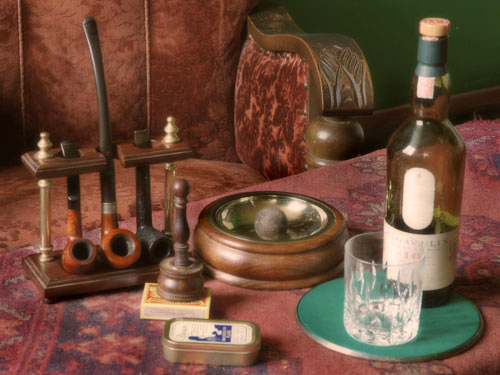 So pick out one of your favourite pipes, fill it with whatever tobacco you like and set it aflame, pour some whisky or another beverage in a glass and slowly scroll through the images beneath. Enjoy. 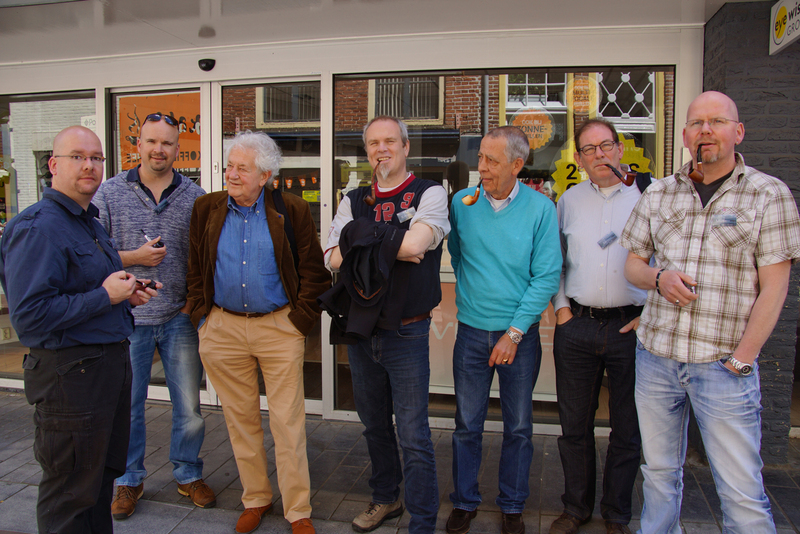 October 12th it was time for the annual “mother” of all the Dutch/Belgian Pipe Smokers forum meetings. 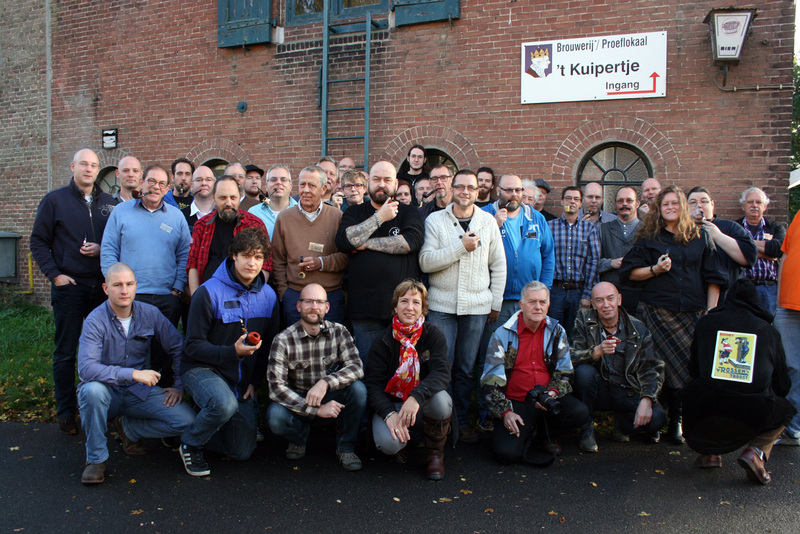 The one in a town in the Dutch province of Gelderland called Heukelum, inside brewery “‘t Kuipertje” and organized by Martin: the Heukelum meeting! For weeks the forum was buzzing with anticipation and whole check-lists of what to take with you were made so nobody would forget anything. 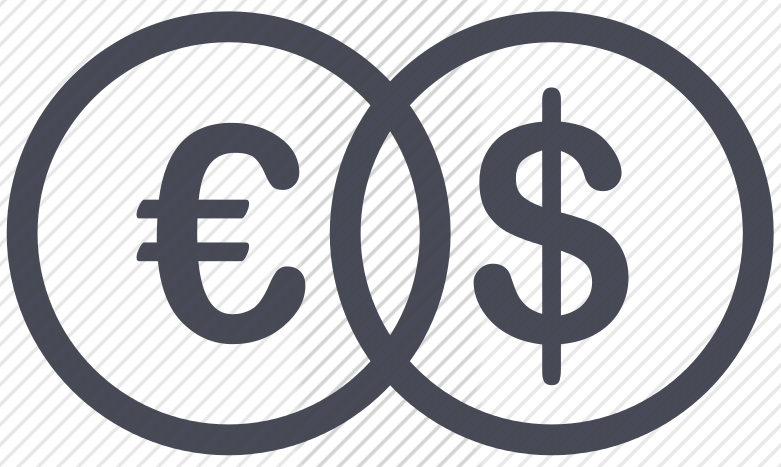 Meanwhile Martin was busy collecting the entrance money: €26.50 (± $33). A bargain if you ask me because for that sum you not only gain access, you also get two drinks, there is a big BBQ with all kinds of tasty fresh meat, sauces, salads and baguettes and last but not least you get one bottle of special forum-beer with a label designed by myself! Whoehoe! Unfortunately for some the entrance money still was too much. Recently forum-moderator and respected member Johnny went through some tough times (private stuff) which left a hole in his finances. My good friend Ed, Mark and I said that he could drive together with us to Heukelum but Johnny was not sure if he was able to manage it money-wise. 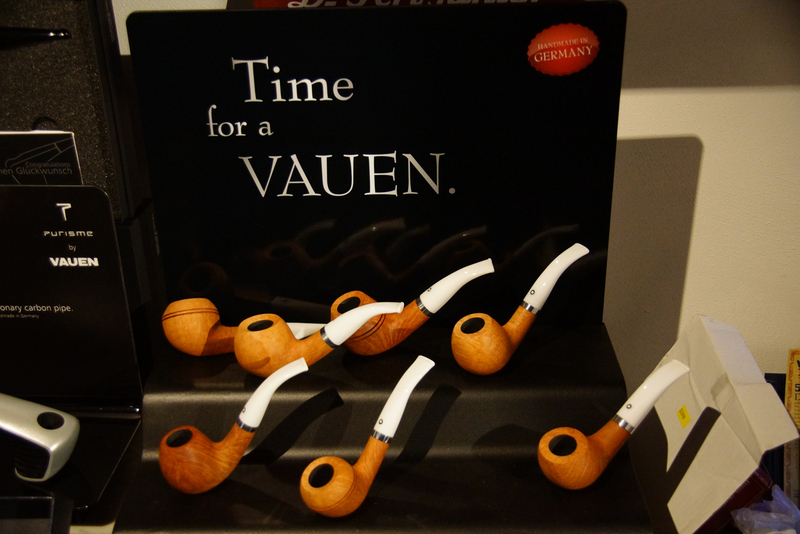 We were all bummed out because after a tough time there is nothing better for a pipe-smoker than a cosy, relaxing pipe-smoking meeting. Suddenly we got a mail from a happy Johhny, he was going! Apparently he got a message from Martin which said that all his expenses already were paid for. And that is the true heart-warming spirit of the forum. So on the day itself Ed first picked me up, then we went to the Deventer train station to get Mark and somewhere along the way Johnny joined us. When we arrived in Heukelum we clearly were not the first. Lines of cars we neatly parked beside each other under which the gracious Volvo Amazon owned by Jos. He was one of the first I looked up because I had something for him and he had something for me. 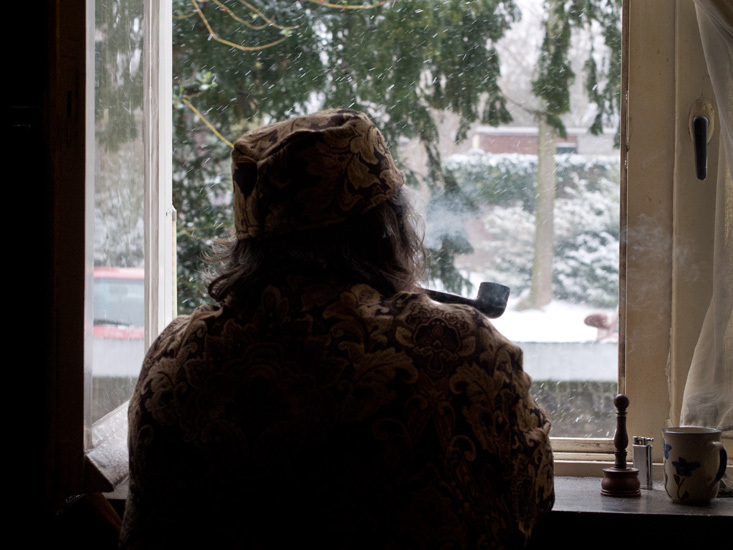 In my “Zestful Zutphen 2014” blogpost I wrote that Jos had bought a “smoking area” sign for me on a Amsterdam market. He had brought it with him and as a “thank you” I had not one but two presents for Jos. 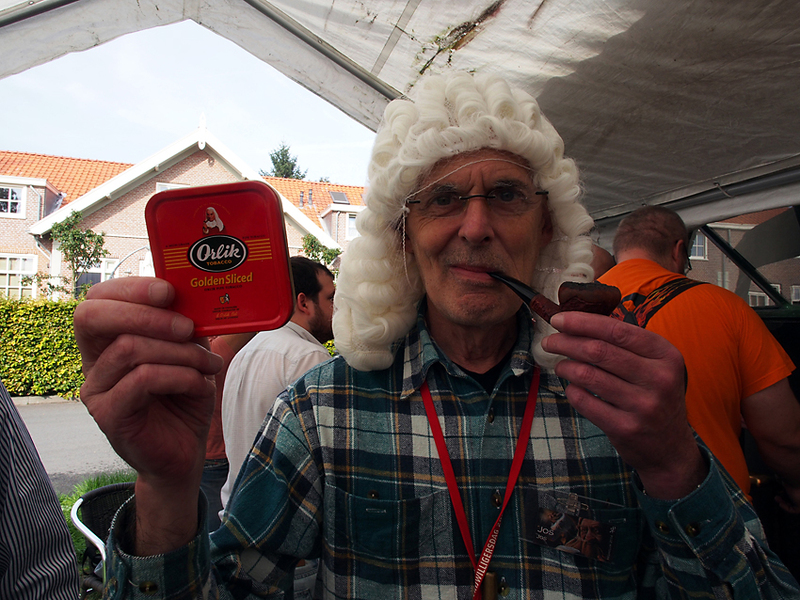 For a living he does something with laws so every time I smoke Orlik Golden Sliced and see the “shrewd judge” illustration on the tin I have to think of him. 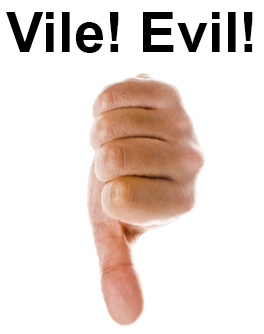 Jos often comes across like a person with some loose screws but beware, he is very, very “shrewd”. So I gave him a tin of Orlik Golden Sliced and a wrapped package. Jos had to laugh hard when he saw the contents of the package: a judge wig. He immediately put it on his head and looked amazingly shrewd to my delight. This week I mounted the sign on the door of my tobacco closet in my working-room. Paul also had something for me. 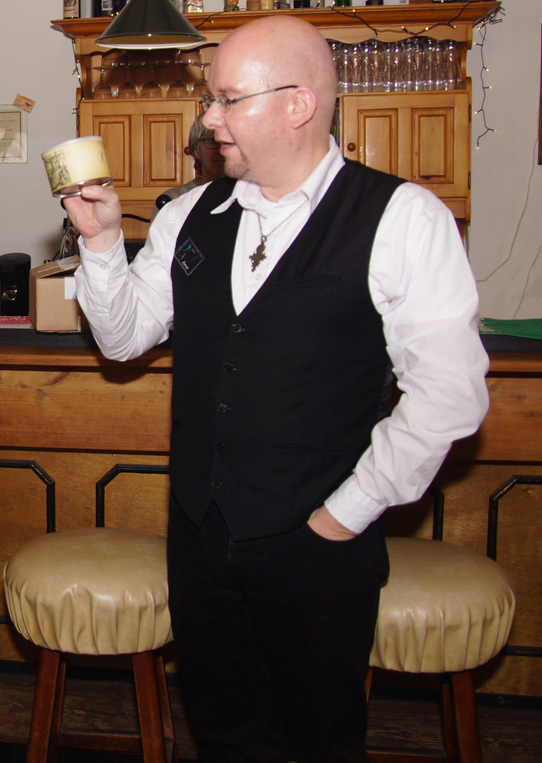 As some of you perhaps know he does whisky nosing & tastings under the name of Whisky Info Plus. On the latest Inter Tabac in Dortmund he had met a company who could print tables. “Hmm, precisely what I need for my nosing & tasting” Paul thought. “A nice bistro table with a picture of whisky-barrels and my logo”. Only, he once made his logo in Word and it was not suited for printing. So he asked me if I could re-make the logo as a proper illustration file. Of course I could, but for a price. 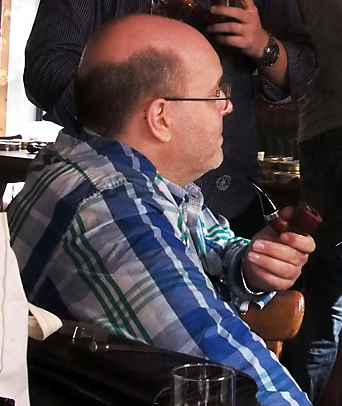 “Some tobacco or whisky?” Paul asked. Since I was making it for a nosing & tasting of whisky I choose that. Paul gave me a round box with on it “Ardmore Traditional“. He explained a bit about it and it really sounded yummie in my ears. And it also tastes yummie, actually, I am having a glass of it right now while I am typing this. Thanks Paul! I also had to see Martin, but not for anything smoking related. A week before the meeting I got a mail from him asking if I wanted buy a Dragon-clock from him. 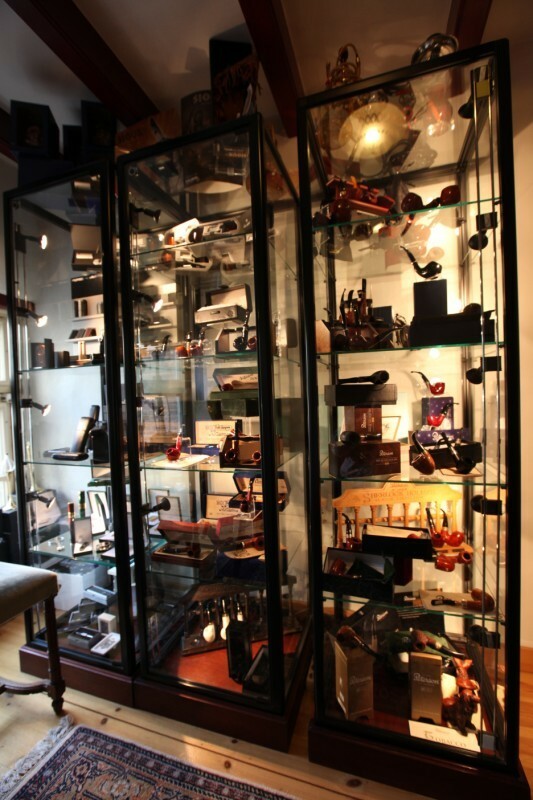 At first I said no, it had no room for it but then I looked to my pipe-cabinet. Hmm.. That clock would look nice on top of it.. So I asked Martin what he wanted for it. 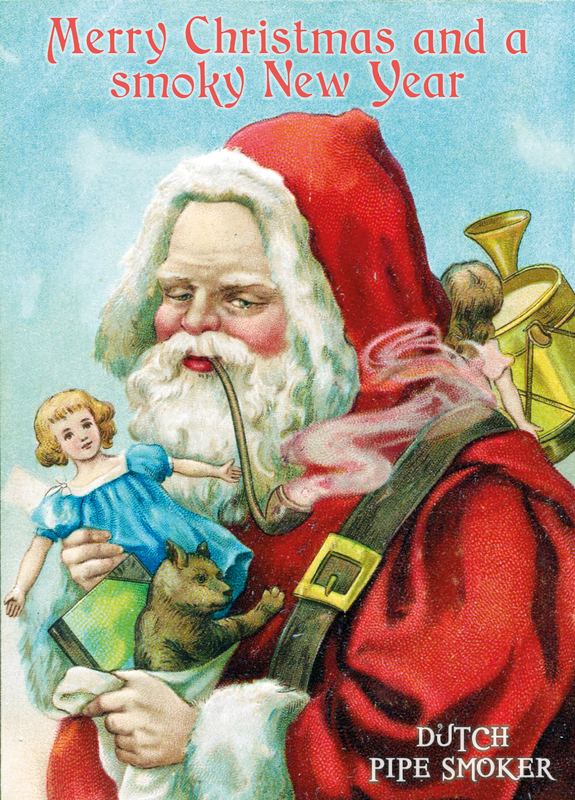 According to him it was pretty expensive new but perhaps some tobacco would suffice? As it happened I just had laid my hands on a bag of Esoterica Stonehaven, perhaps that was ok as a payment? 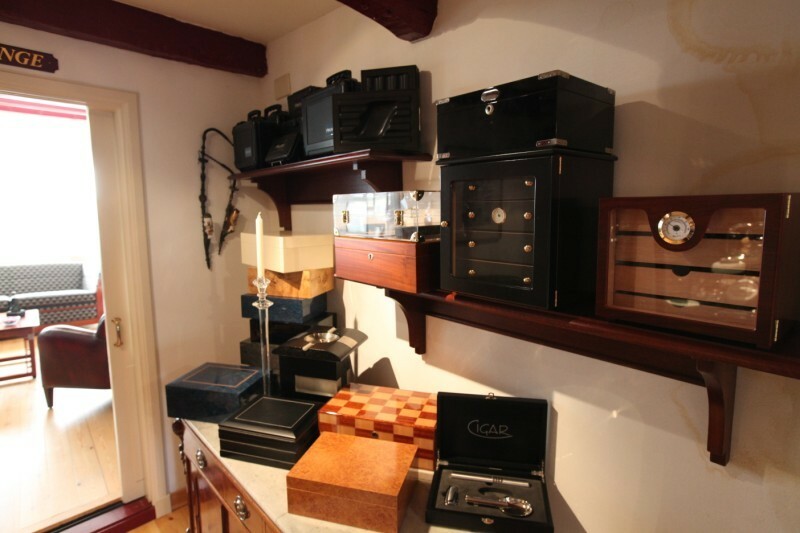 Eagerly (I know he loves the stuff) Martin said yes so now the clock graces my pipe-cabinet. 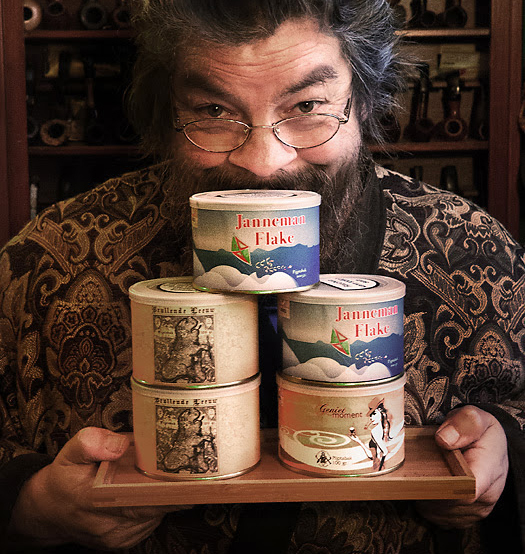 A while ago forum member Robert-Jan visited me but he forgot to take with him a tin of Hajenius My Own Blend. I kept it for him until I had the chance to give it back. I also smoked some of it (I was allowed to) but mwah.. 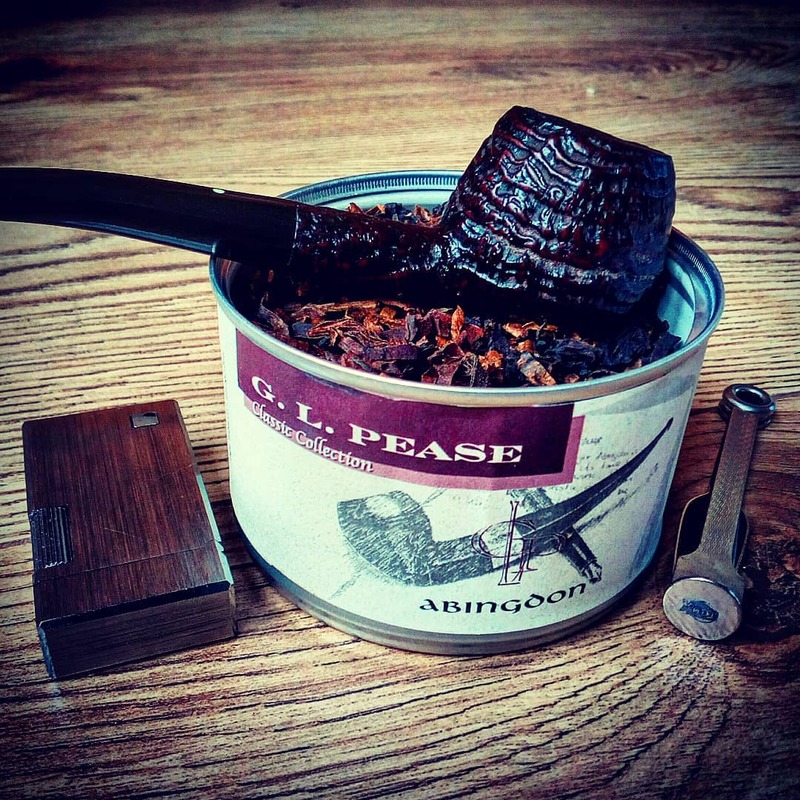 I did not like it, I was a bit under the impression that cheap tobaccos were used. So I was glad I could give back the tin at the meeting. Oh!! 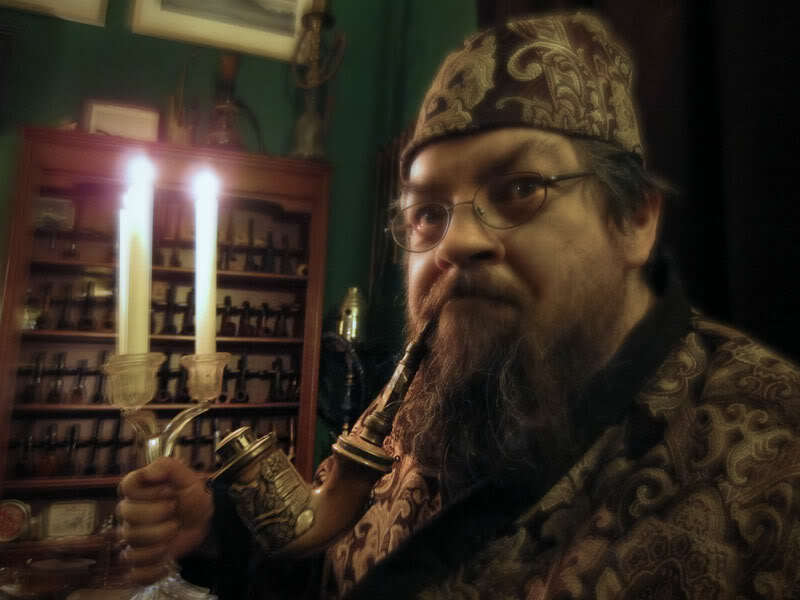 I silently cursed.. Robert-Jan had asked if I could bring a sample of Esoterica Penzance with me for him. And I had totally forgotten about it.. Of course I made up for it later. Some time later we were all asked to gather around. 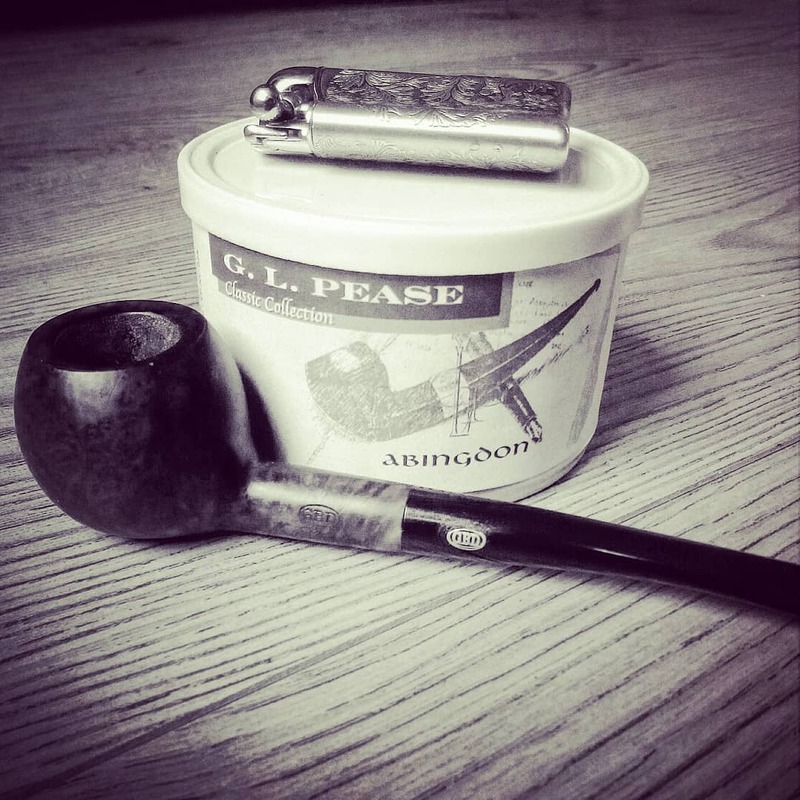 The time had come for the unveiling of the 2015 PRF forum year-pipe! Normally Shaun arranges the whole project but sadly he had been very ill this year (luckily he feels a lot better now).. Despite his sickness he managed to reach out for help and Dre answered his call. 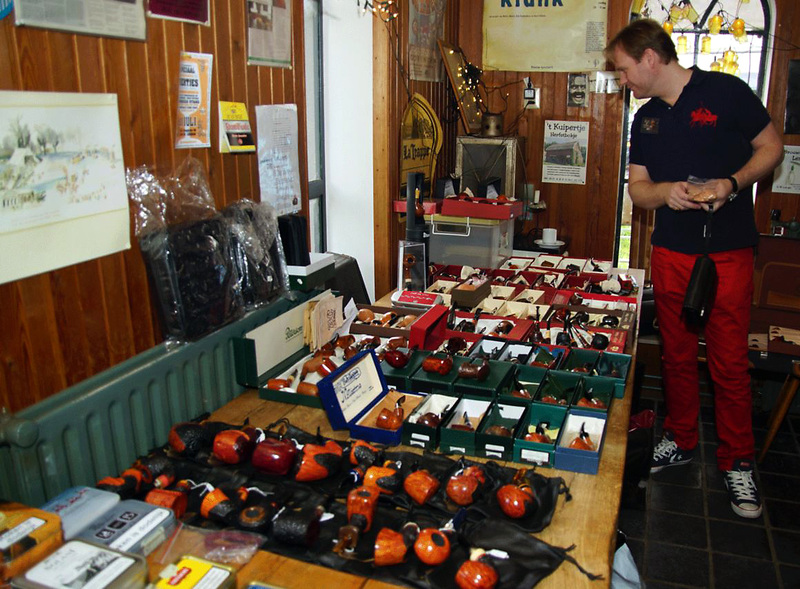 Dre (Andre) has very good connections with the Gubbels family from the Big Ben pipe factory and regularly visits the place. So he asked if they could mean anything for the PRF pipe project. Unfortunately Big Ben only fire up their machines for a minimum of 500 pipes and the forum can never reach that number. BUT they had an alternative solution. 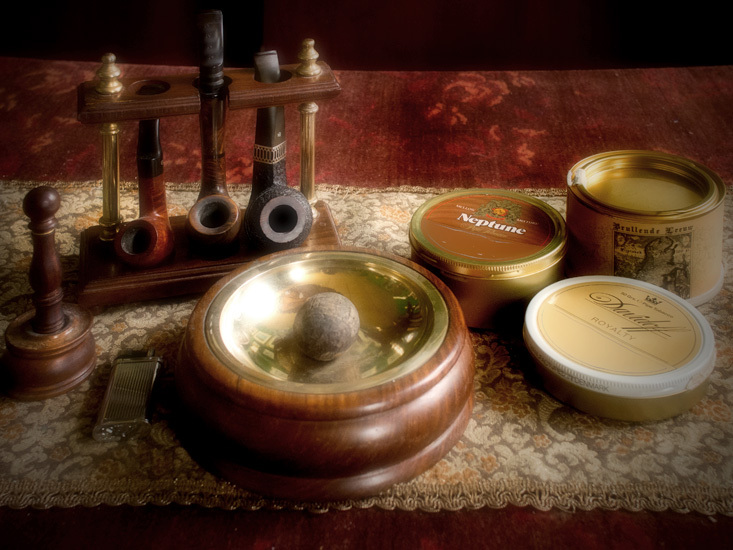 Throughout the years Gubbels kept Barbados shape pipe-bowls behind with an exceptional grain and we could have those! 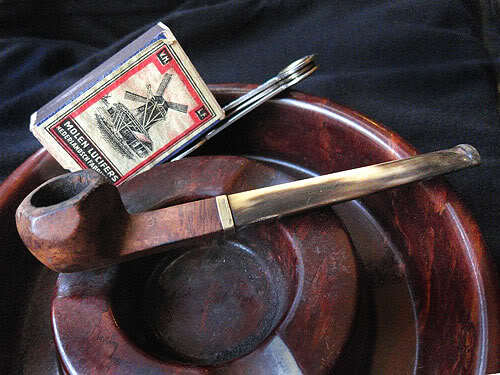 Plus they added a metal ring on top of the bowl which makes the pipe look even better. When Shaun and Dre told this and showed the pipe they got a very well deserved applause. After some chatting with a lot of forum members it was time to eat! As I told last year the meat provided is of excellent quality and comes from a nearby biological butcher. Just as I expected the beef was gone first, I also have to thank myself for that.. After dinner I sat down beside Franz. 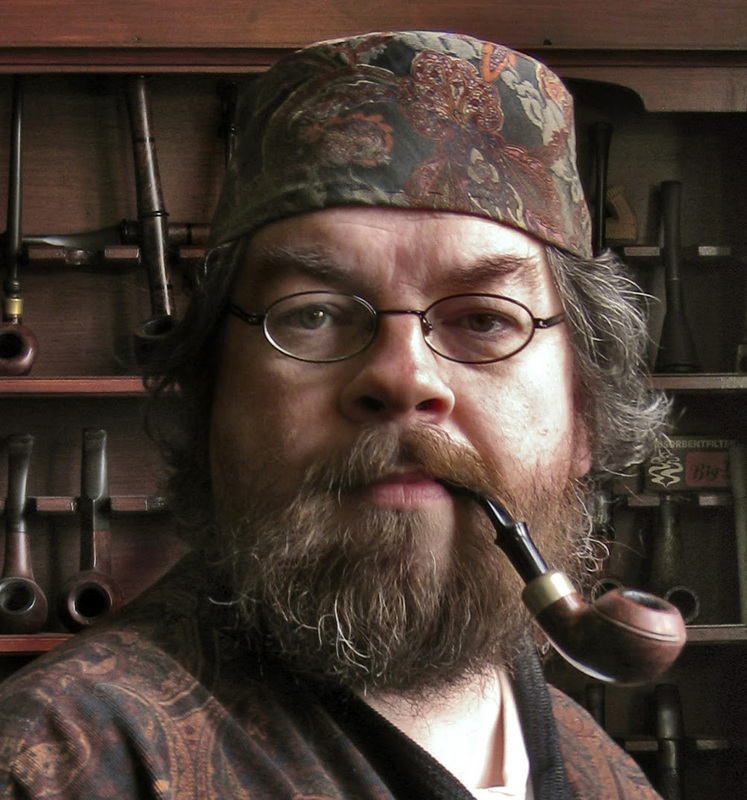 I am a bit of a Dunhill collector (if I can get them cheap) but he collects all kinds of English non-Dunhill pipes like Sasieni and Charatan. He has a stunning Sasieni prince and.. Wait, just a moment.. Sorry, every time I think of that pipe I have to wipe off my drool. I can’t stop admiring that one. 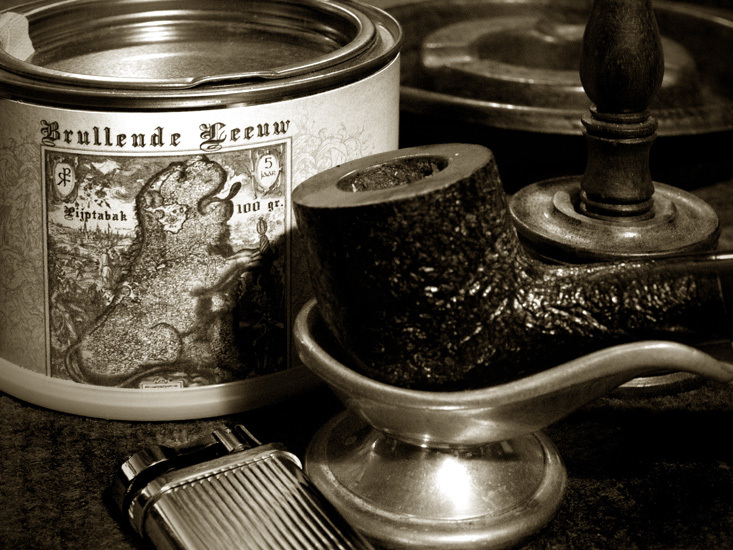 Franz also had brought with him some Germain Rich Dark Flake which I never had smoked and was very curious about. Luckily I was allowed to take a sample with me so now I can finally compare it to its famous brother: Esoterica Stonehaven. Gradually darkness fell all around us, the lights went on and I just had to think of the atmosphere Dutch painter and graphical artist Anton Pieck summons in his creations. Slowly one by one people were going home until just a few were left. 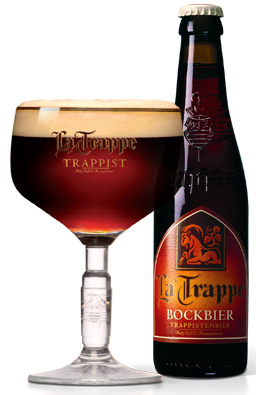 I bought some more bottles of the tasty forum-beer (which was a bock-beer this year!) 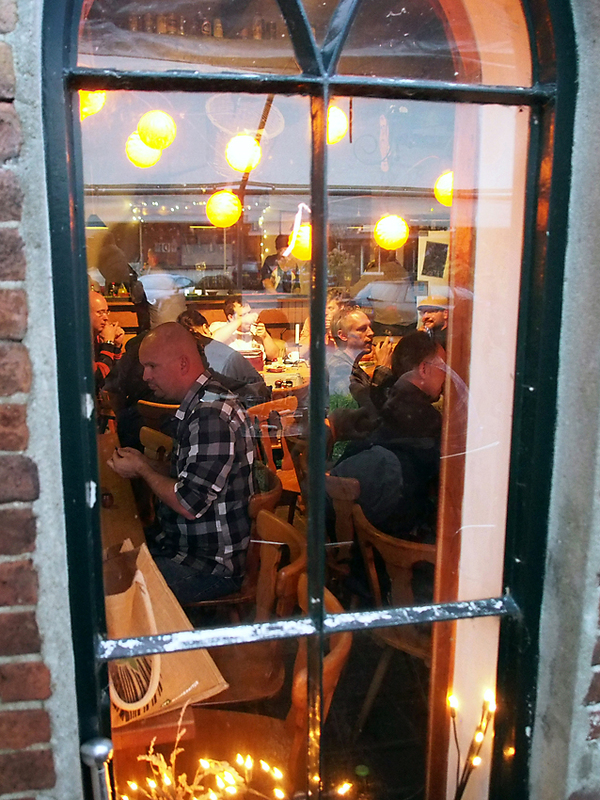 and we all helped owner Henk a bit with putting back some tables and chairs. 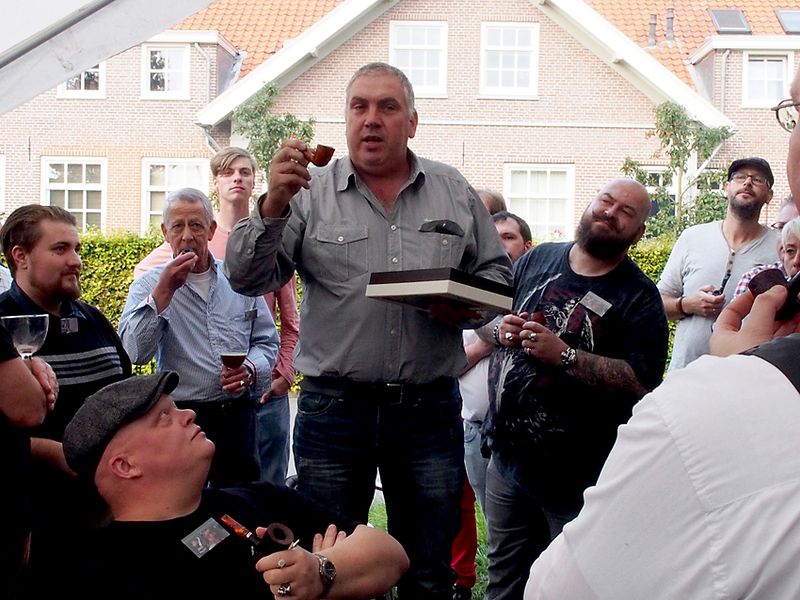 Then we said goodbye to each other and thanked Martin and Henk for the wonderful day. Johnny was a bit quiet. Apparently upon entering the brewery he had received a stash of consumption-coins from Martin so he had free drinks all day long. 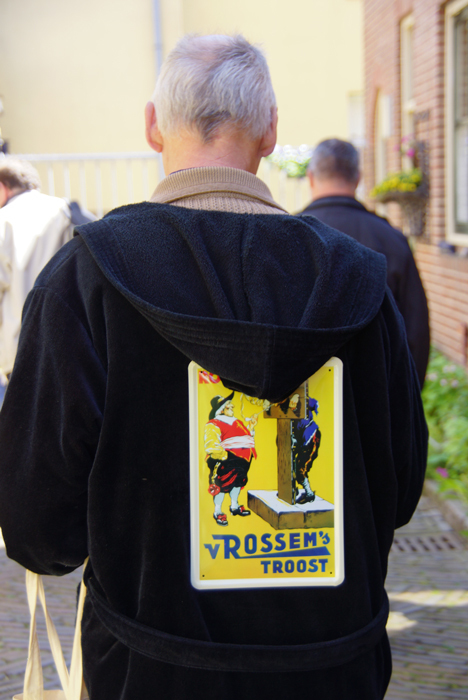 But he also had gotten a small bag, a gift from our forum-Sint, Rob. I opened it and literally my jaw dropped, eyes went a bit wet and I immediately understood why Johhny was so quiet. 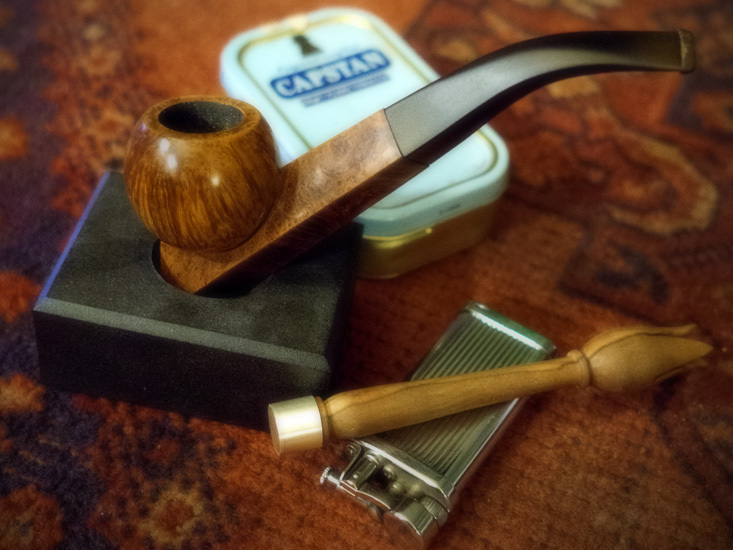 The contents were a Winslow and two Dunhills under which a gorgeous gold-band shell briar. And that is also the true heart-warming spirit of the forum and I am proud to be a member of it. 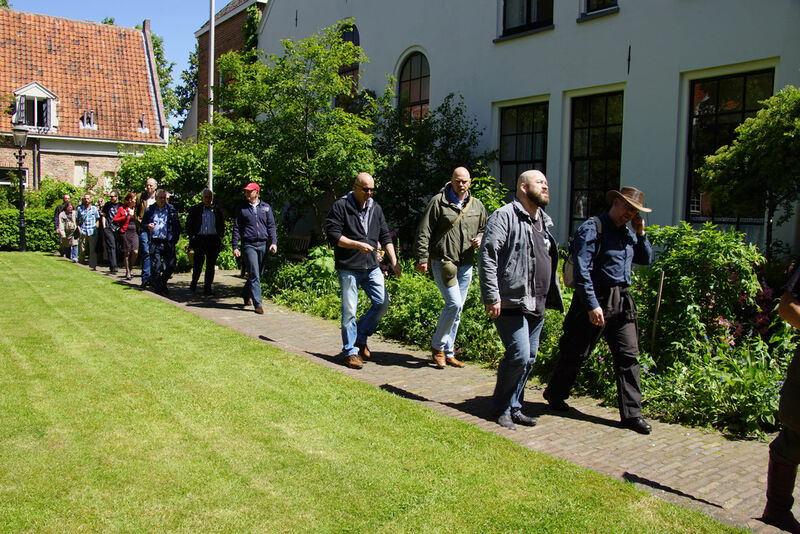 Henk and Martin, thank you for the organization of the meeting! Ed, Johnny and Mark, thank you for the pleasant rides! The rest of the members, thank you for a great day! 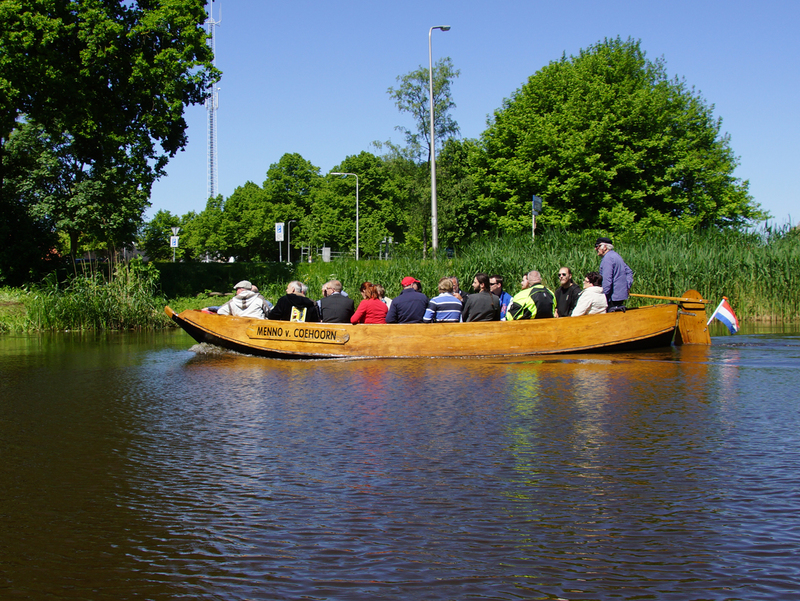 All pictures were made by Klaas, Janneman and myself. 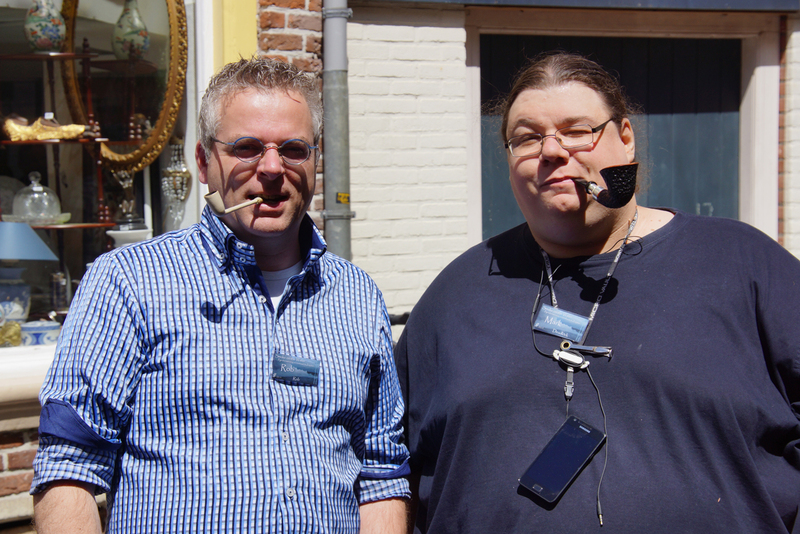 Like I told in my Zestful Zutphen post the Dutch/Belgian Pipe Smokers Forum currently roughly has two big annual meetings. Well, three with the meeting in Wuustwezel, Belgium. 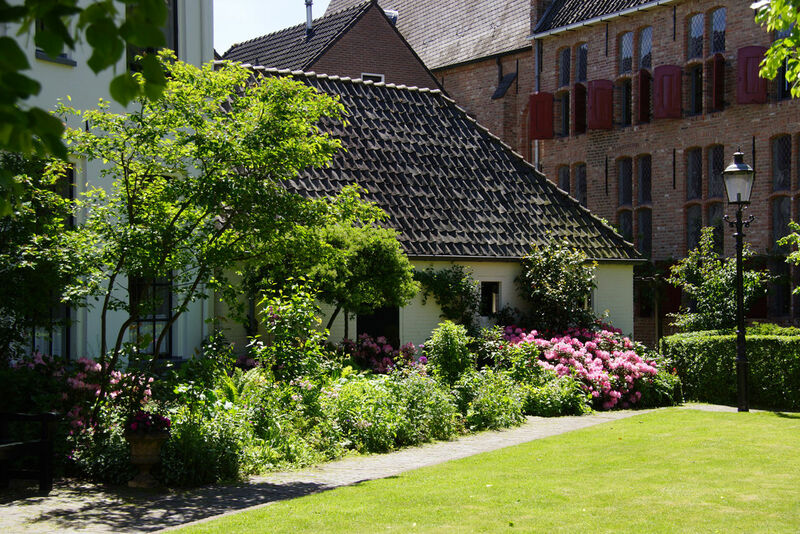 But the “mother” of all our meetings is the one in a town in the Dutch province of Gelderland called Heukelum. 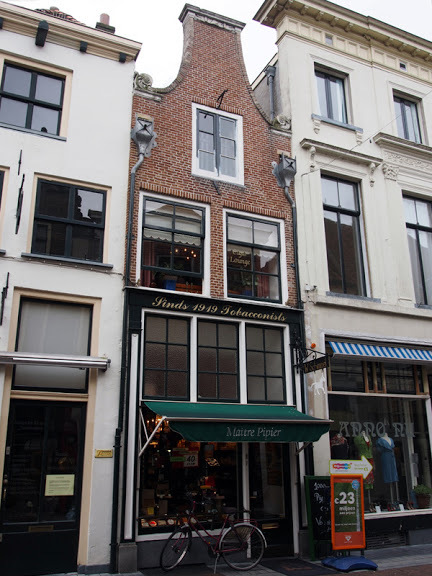 Well, this is not entirely true.. First Martin organized the meetings in his nearby home-town of Leerdam on the upper floor of a restaurant housed in an old train-station building. 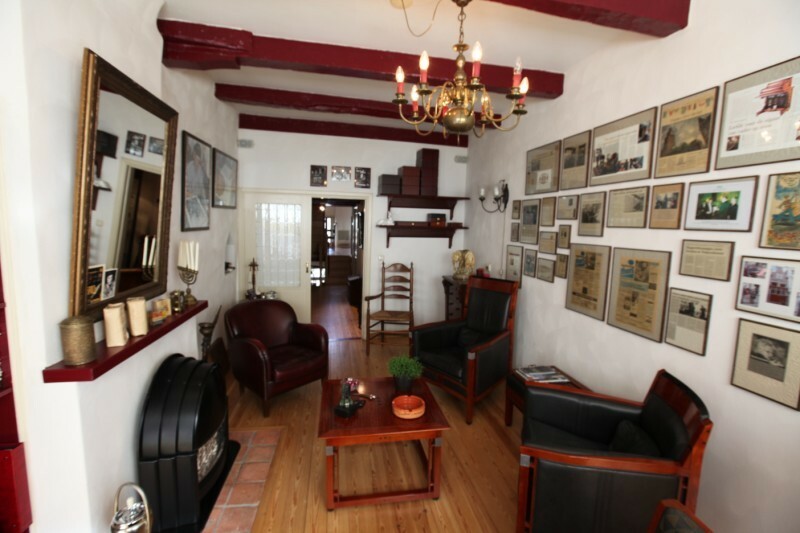 Unfortunately after 2 cosy meetings the owners did not want us there any more plus the group got too big. 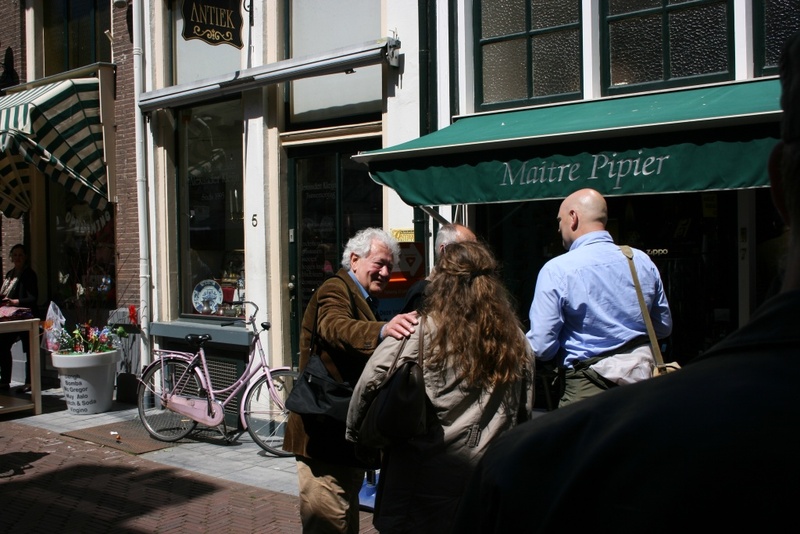 So Martin had to look out for another location which he luckily found in brewery “‘t Kuipertje“. 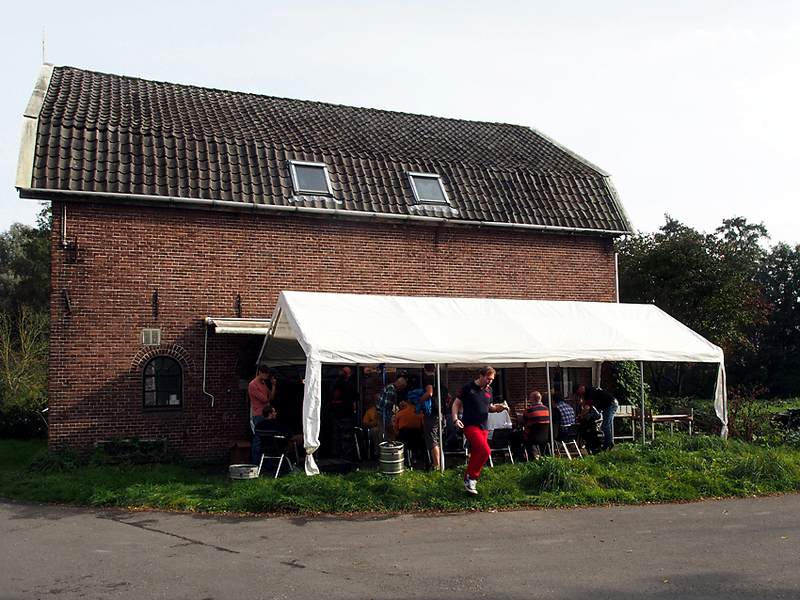 In 1987 brewery ‘t Kuipertje first started when Frits Kuiper, after a reorganisation at his day-job, could work for half days only. The first beer was brewed on February first 1988. 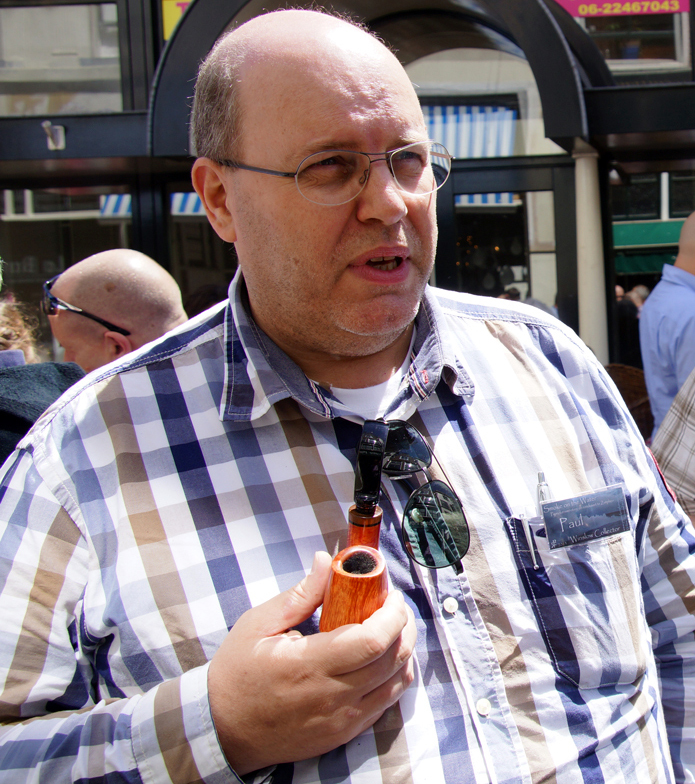 Frits, an amateur-brewer, soon decided to completely leave his (half) day-job and go full-time with the brewing. 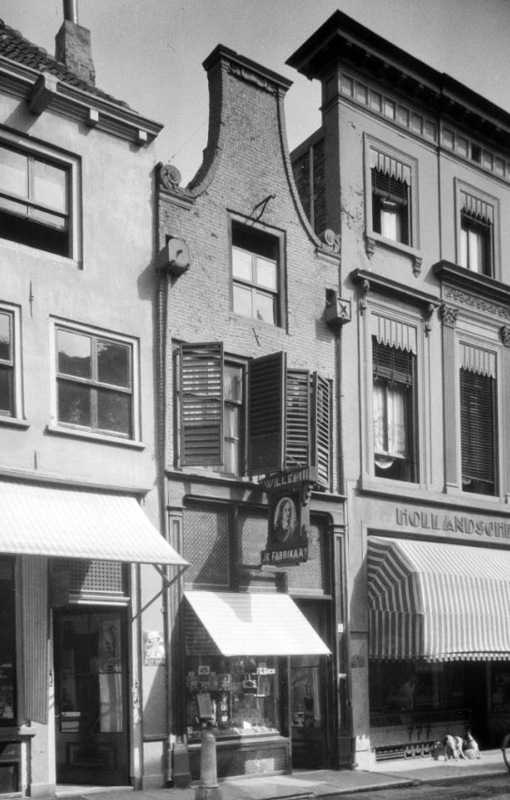 After being an apprentice at several breweries he made his own brewing-installation and started his business under the name “Gelderse Bierbrouwerij ‘t Kuipertje”. In 1990 he moved into the former coach-house of an old stone-factory at the border of Heukelum where the brewery is still located today. 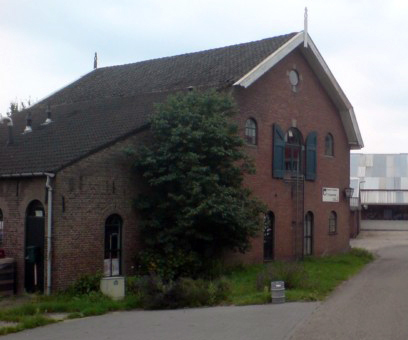 At January 1th 2002 Frits left the brewery, his son Henk took over business. 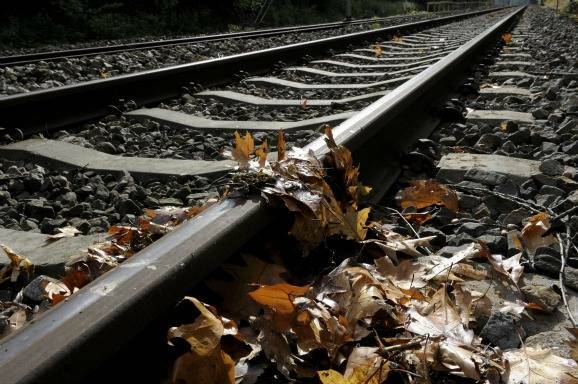 The big nightmare of the Dutch railways: leaves on the rail-tracks.. So on October 27th at the end of the morning Ed arrived to pick me up. Also in the car was Maurice, the more the merrier! 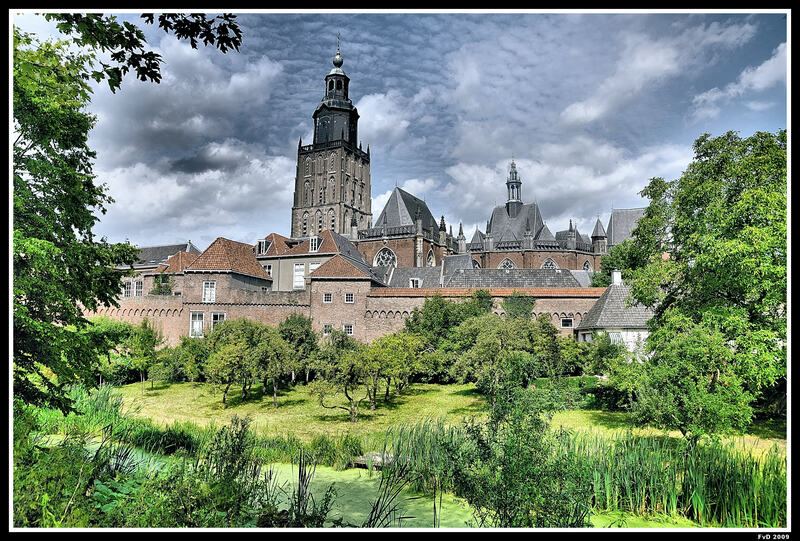 Together we drove to the train station of Deventer to pick up another forum-member, Mark. But after some waiting there was no sign of our big friend. Suddenly I got a text message from Mark, the train which he was supposed to be on was delayed.. Grumble, bloody Dutch railways.. If you are ever in The Netherlands, do not go by train unless you don’t mind delays. In wintertime there is snow, in autumn there are leaves on the rail-tracks, in summer maintenance is going on.. Grrrr.. Anyway, Ed, Maurice and I had enough to talk about and before we knew it Mark arrived, his train finally had come. Because of the delay we were a bit late in Heukelum. Normally we are amongst the first ones to arrive so you can greet everyone more easy as they come in. 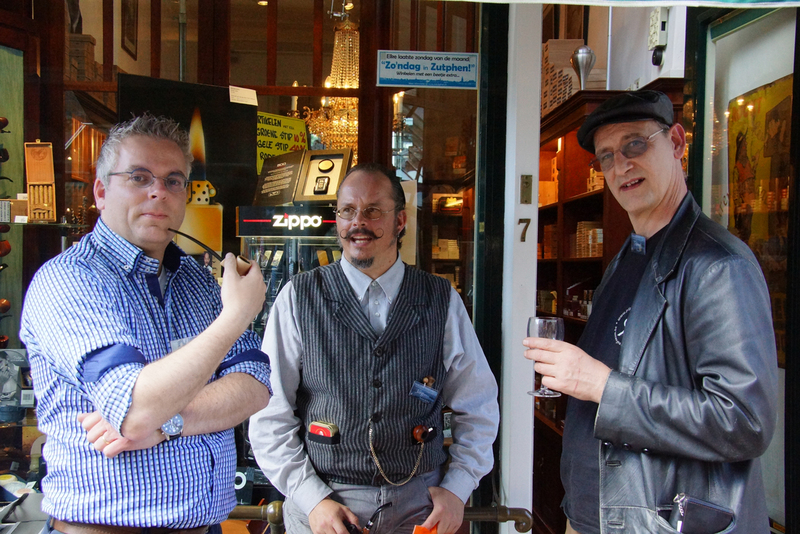 Now we immediately were immersed in a cloud of friendly pipe-smokers who all wanted to say hello. While shaking hands I first began with some “business”. 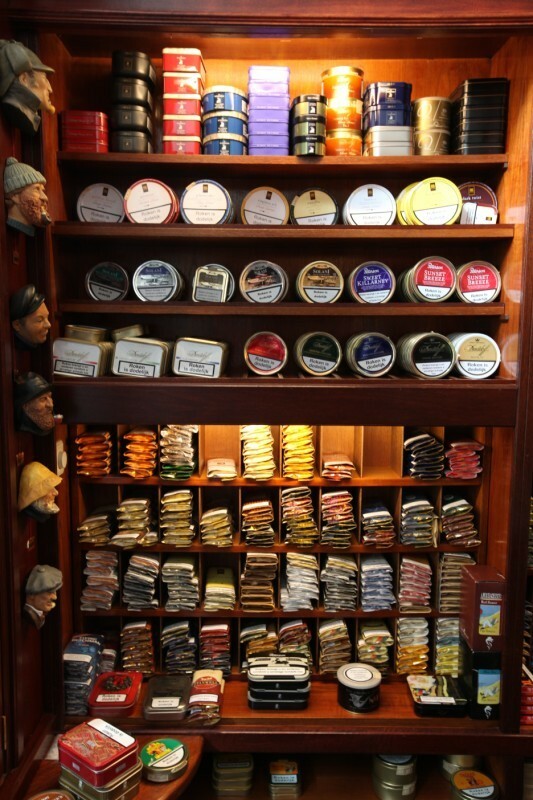 When I visited the big Heinrichs store I bought a tin of Heinrichs Golden Sliced and Dunhill Deluxe Navy Rolls for forum-member Klaas. He was curious about the famous Escudo and Deluxe Navy Rolls come very close in taste to that one. And he also had something for me. 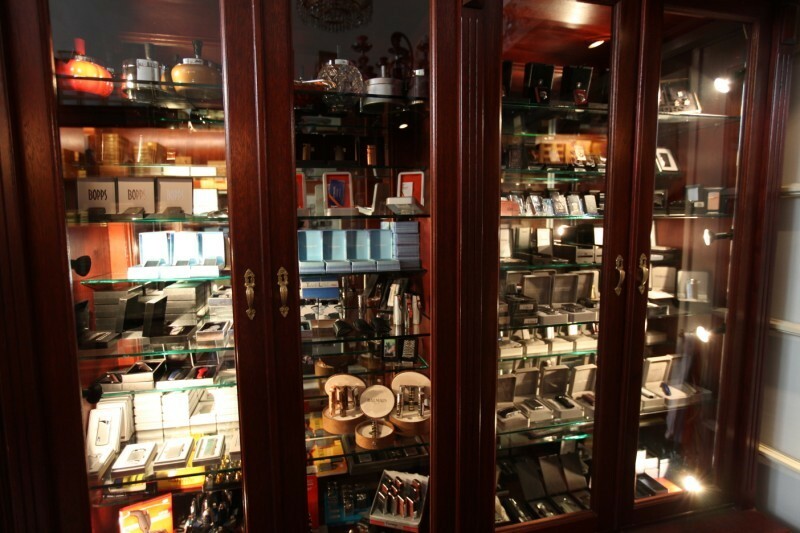 The week before the meeting he and his wife went to Prague where he bought some Stanislaw (made by Samuel Gawith) tobaccos. 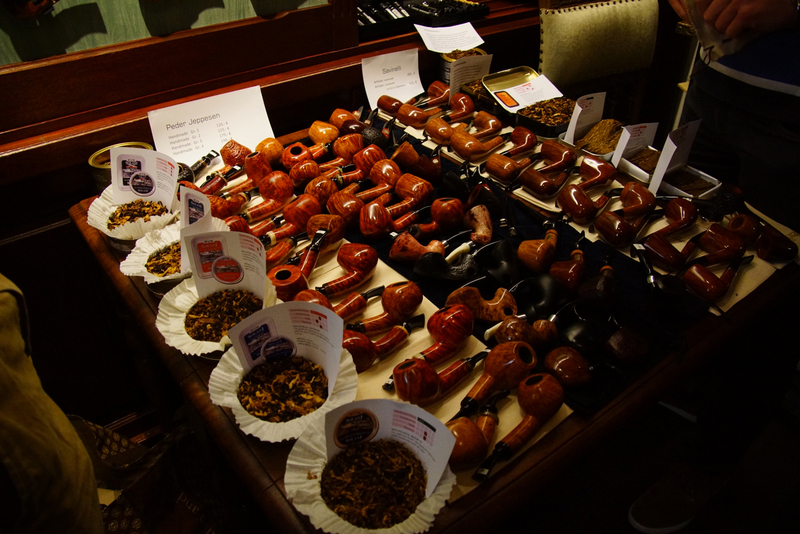 This were the ones I saw at the Inter Tabac fair at the Samuel Gawith stand! Wonderful! Apparently they are only obtainable in the Czech Republic. After we exchanged tins I tapped Rob on his shoulder. I had a bag of rare Penzance for him. 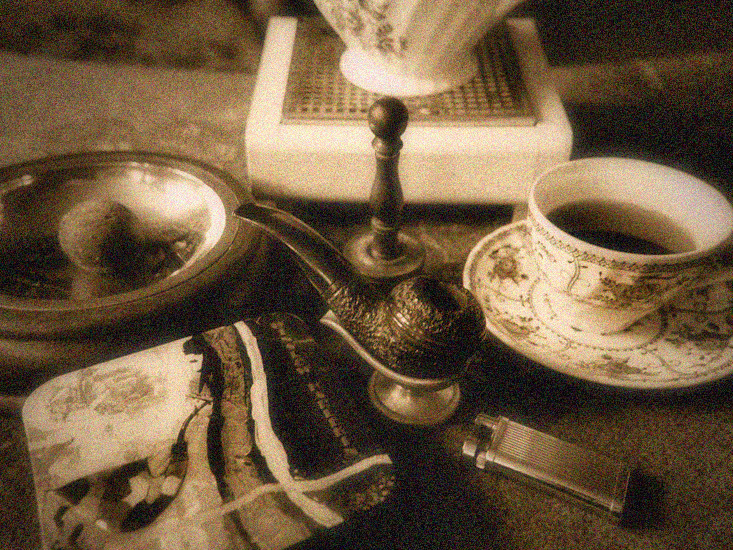 Really a treat because Rob loves to smoke latakia blends. Well, you can’t go wrong with Penzance then! When I turned around I saw another Rob (many folks called “Rob” on the forum). 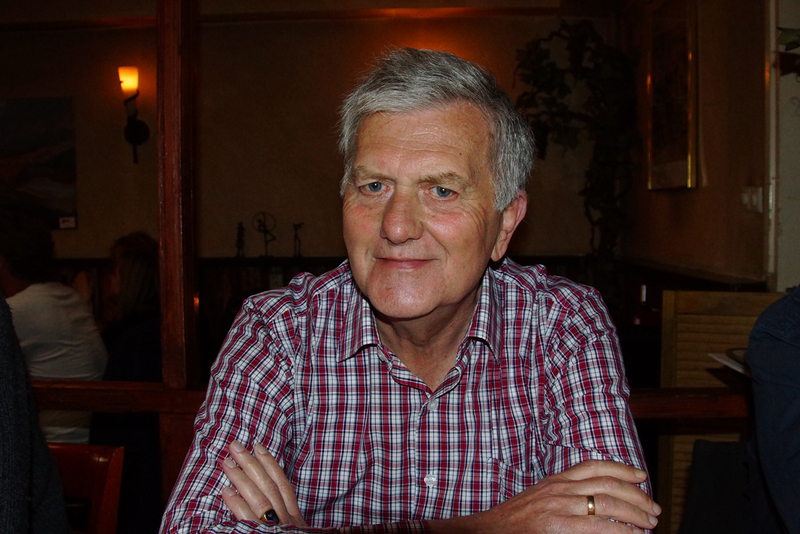 He lives in a place near the town I grew up in the province of Brabant and has that typical joviality and accent of most people there. 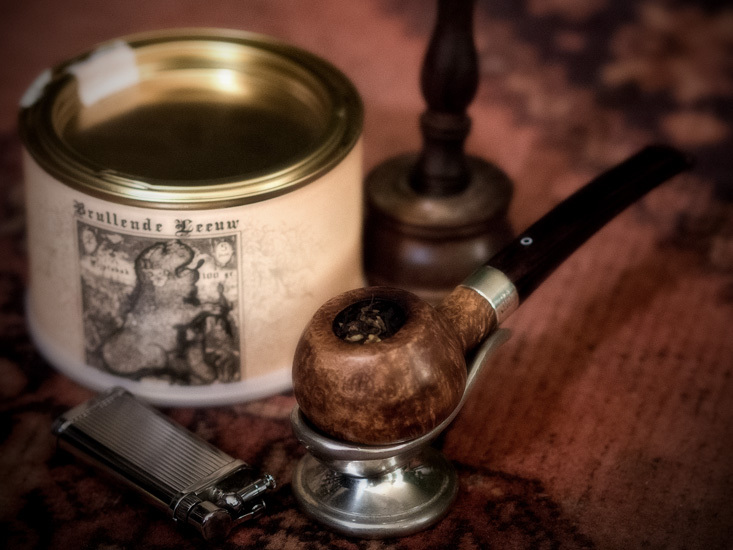 Rob has a passion for Ireland and I happen to have some authentic Irish Murray plugs (Erinmore Plug, Warrior Plug) which were gathering dust in my tobacco-closet. “Aah!! Fantastic! What do you want for them?” he asked. 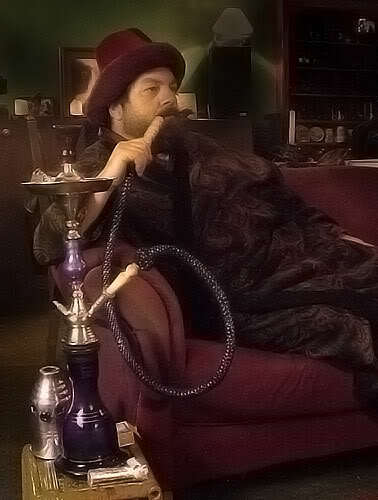 “Absolutely nothing, smoke them with much pleasure” I answered. I always like to see tobaccos I don’t smoke get a good home. Last but not least I walked over to like-minded Robbin. 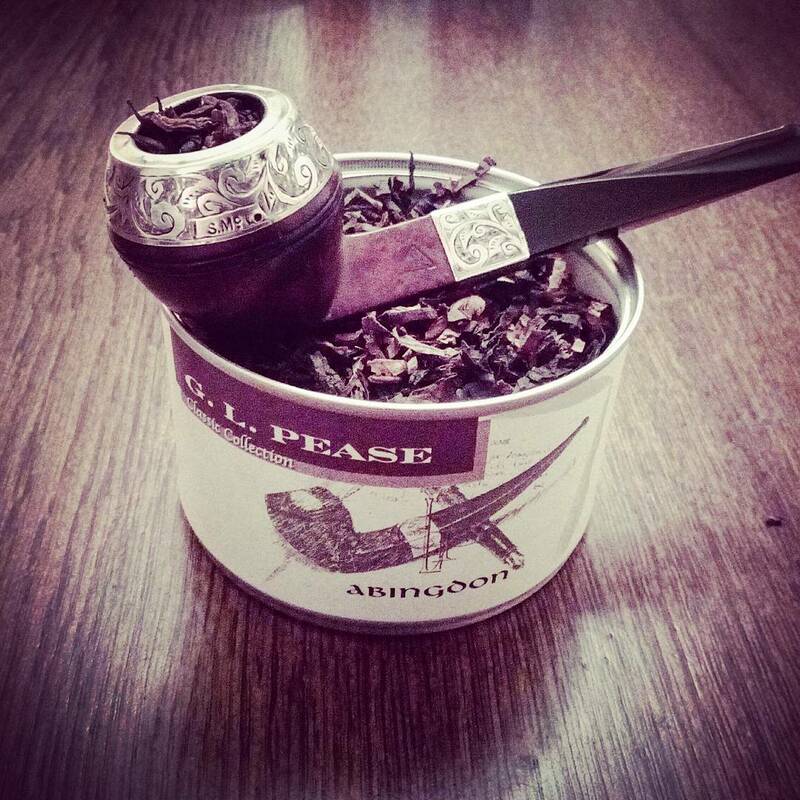 We both love old English blends and prince-shaped pipes. I had an opened tin of the German version of Presbyterian for him which he was curious about. I also presented him a sample bag of a nameless mixture I once made which I knew he liked. Then I finally could relax a little bit and order a beer. I asked Henk, who also was the bartender, if he had a dark beer, for which I have a fondness. 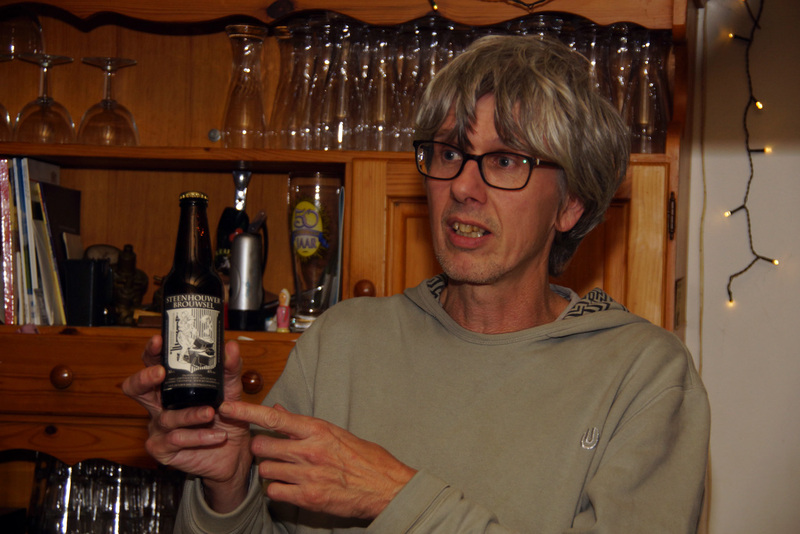 He offered me his self brewed Bokbier which is a special kind of dark beer that in The Netherlands is brewed only in autumn and often has a bit of a dark sweet caramel taste. After I gulped down the tasty liquid my nerves went down a bit. 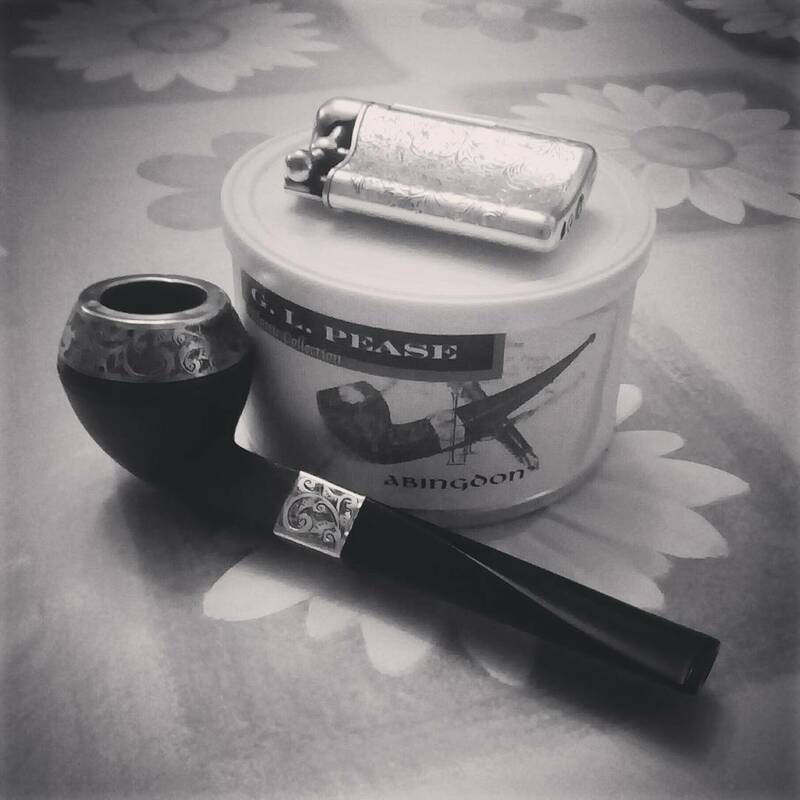 Nerves because I had to introduce the brand new forum tobaccos! 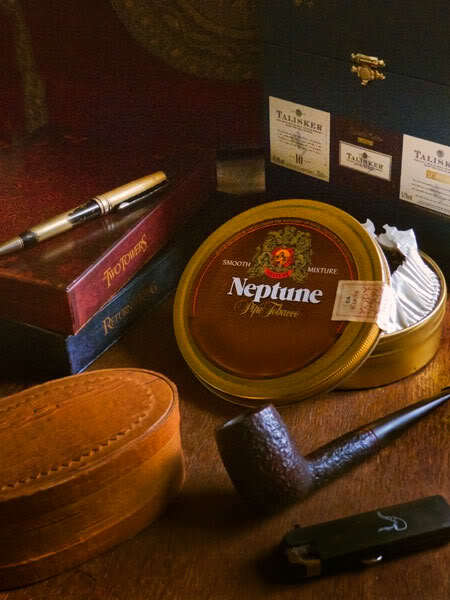 For those of you who read this blog regularly, last year and this year I have been busy organizing 3 specially made tobaccos for the forum-members. 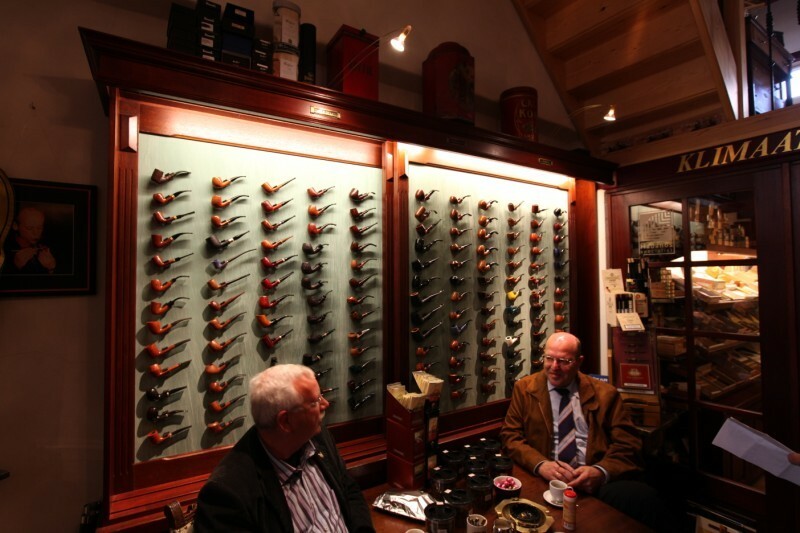 This because this year the Dutch/Belgian Pipe Smokers Forum exist 5 years. 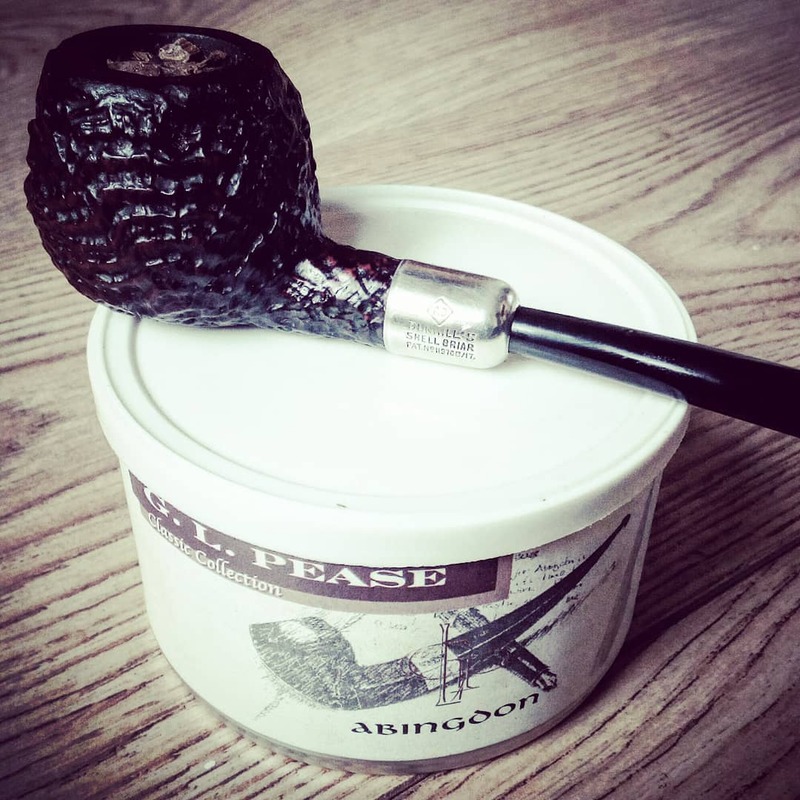 If you read the last comment on that post you can see my “quest” continued because master-blender Hans Wiedemann from HU Tobacco took me under his wings. What happened after that is a story in itself which I shall tell in a future blogpost. 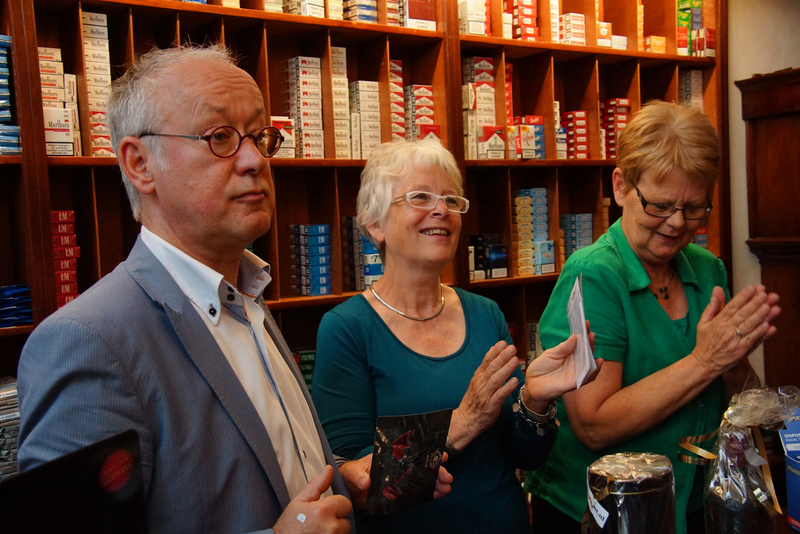 I introduced the three tobaccos, told what my inspirations were, said what the tobaccos roughly were made of and encouraged everyone to try some. Of course I brought sample tins. After my speech Paul walked towards me and presented a gift to me from the forum members for all my work on the forum tobaccos: a bottle of peated whisky! Yummie! And not just a regular bottle, no, a very special one! A 23 years old Jura ‘Signatory’! 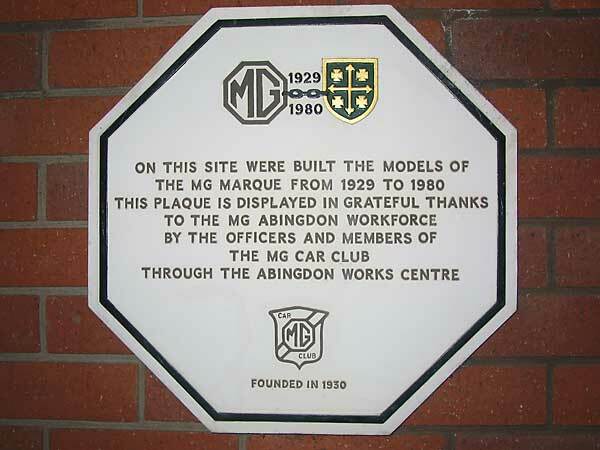 So to all the forum-members who contributed to this great gift, a big thank you!!! 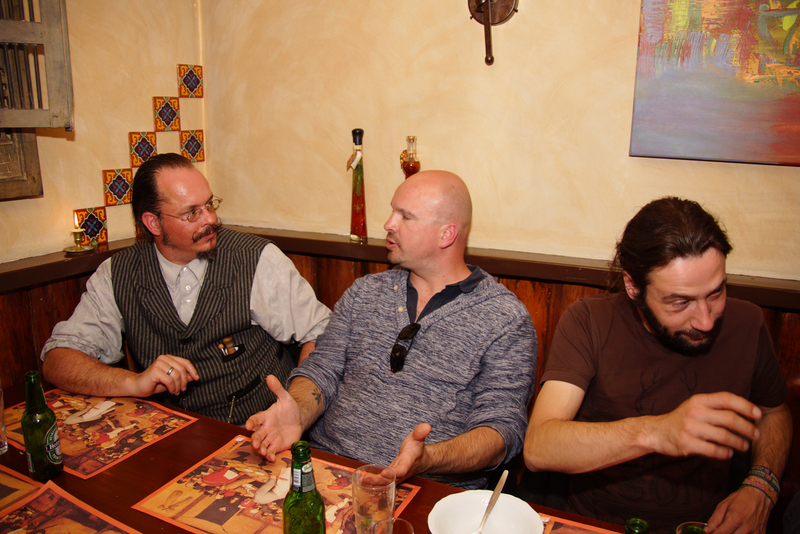 And because this was the 5th meeting organised by Martin he also got a well deserved bottle of whisky. It is always remarkable how fast time goes when you are having a good time. You chat with someone for a bit, walk around, somebody starts talking to you, you go outside for a fresh nose while continue having conversations etc. So many nice folks and so little time.. 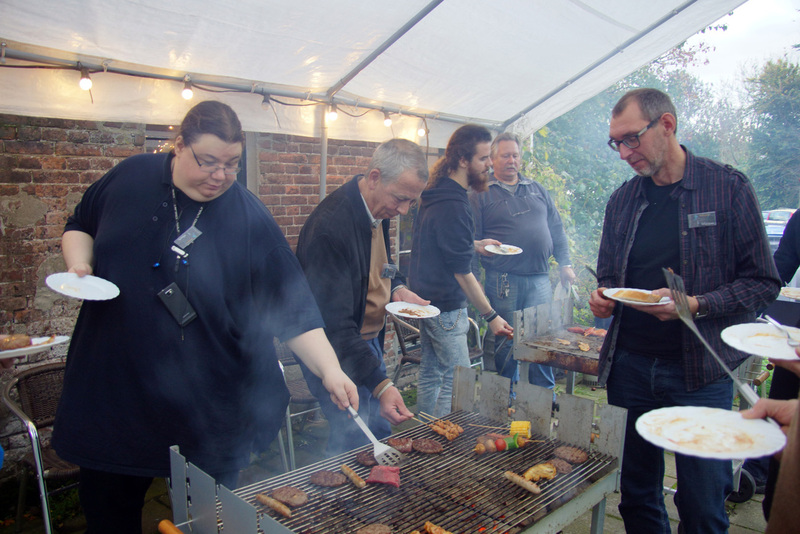 In the mean time Henk had ignited the 2 BBQ’s and soon the coals were hot enough to begin with dinner. Like always the provided meat was of excellent quality. We could choose from beef, bacon, cutlets, hamburgers, meat skewers, all kinds of sauces, baguettes and salads. Aahh.. Grilled meat, tasty beer, a good pipe-smoke and great people. What more can a man wish for? After dinner we sat down for a couple of more drinks and conversations and too soon it became time to go. We said our goodbyes to the remaining people, picked up a bottle of the specially brewed 2013 forum beer and went to the car. Once home I thanked Ed for the ride, said farewell to Maurice (we already brought Mark home) and went inside the house. I kissed my girlfriend Ellen, put away my bag full of tobaccos and went to bed where I had some nice smoke-filled dreams. Here are some more pictures because they tell more than a lot of words! 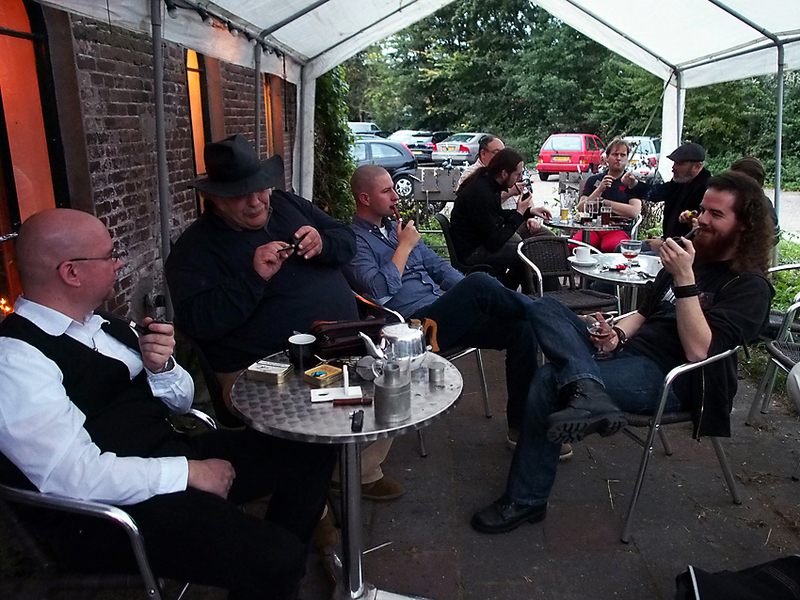 Whisky and Tobacco (by Paul) – Part 2. 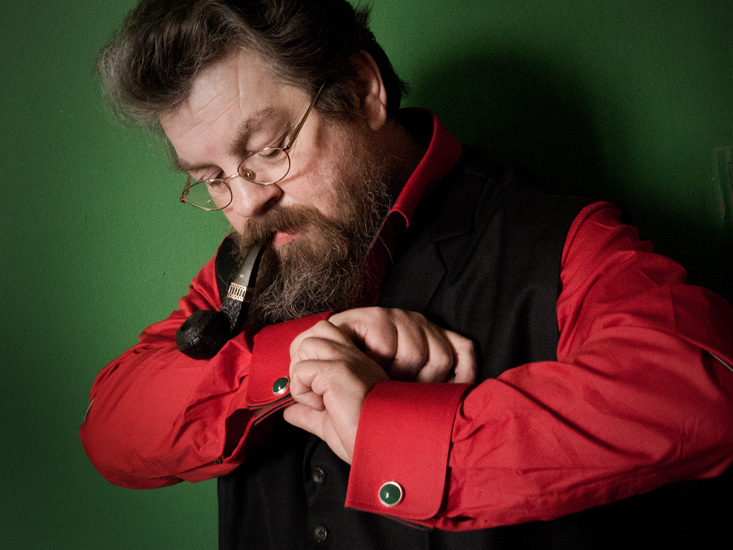 This is part 2 of the “Whisky and Tobacco (by Paul)” post. Click here for part 1. 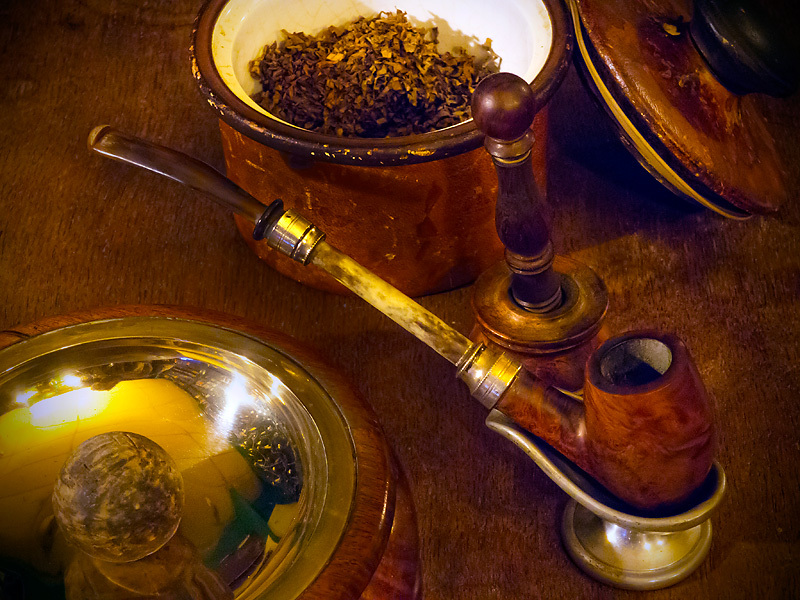 Tobacco blends with Perique have that typical sour aroma and taste. There are not many “sour” whiskies/whiskeys. But you could try an American Sour Mash whiskey, like some well known brands produce, like Pappy Van Winkle, Jim Bean, Woodfort Reserve, Maker’s Mark, Wild Turkey and some Jack Daniels expressions. 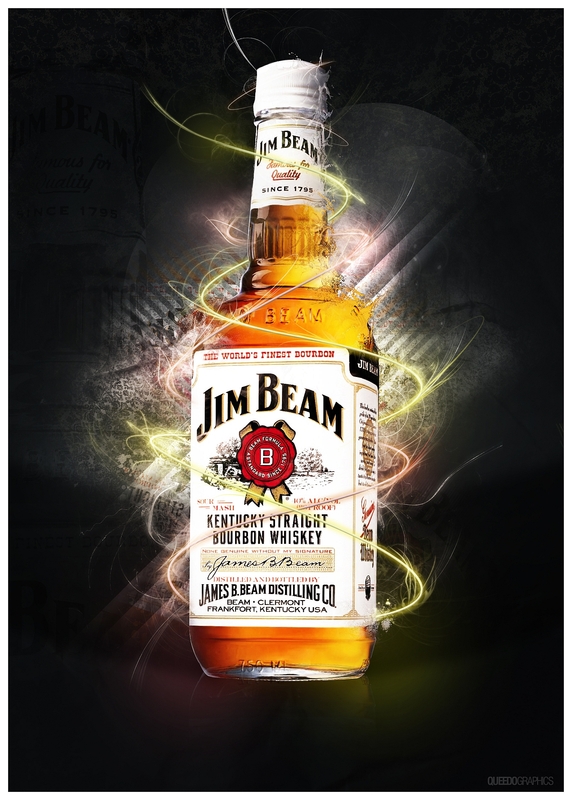 Note that the Sour Mash process is used in almost all Bourbon and Tennessee whiskeys. If you are looking for that typical aroma, check the indication “sour mash” on the label. The process doesn’t make a whiskey with a sour aroma-note as per definition, they can turn out very sweet and with vanilla/caramel aromas. As for Scotch single malts I can’t easily come up with whiskies which have a sourly aroma or taste. It’s a taste most whiskymakers do not want in their whisky. The only one I ever encountered that would fit in here is an independent bottling of Edradour 10 yo from The Un-Chill-Filtered Collection, distilled 12-08-1998 and bottled 20-11-2008, 46% alcohol and from cask No. 286. 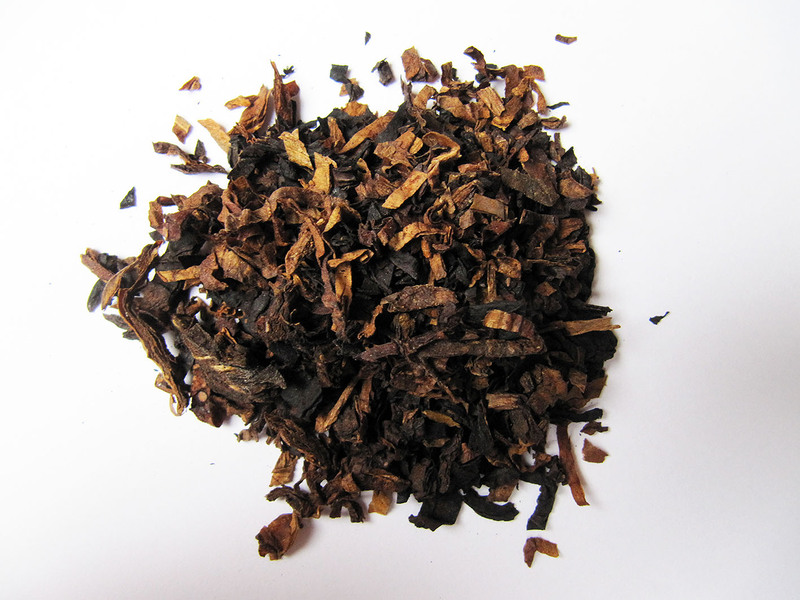 Besides looking for a sour taste in the whisky (and because Perique brings out more complexity out of the Virginia tobaccos) you could try such a tobacco-blend with a more complex whisky, like mentioned next, under Virginia/Oriental blends. 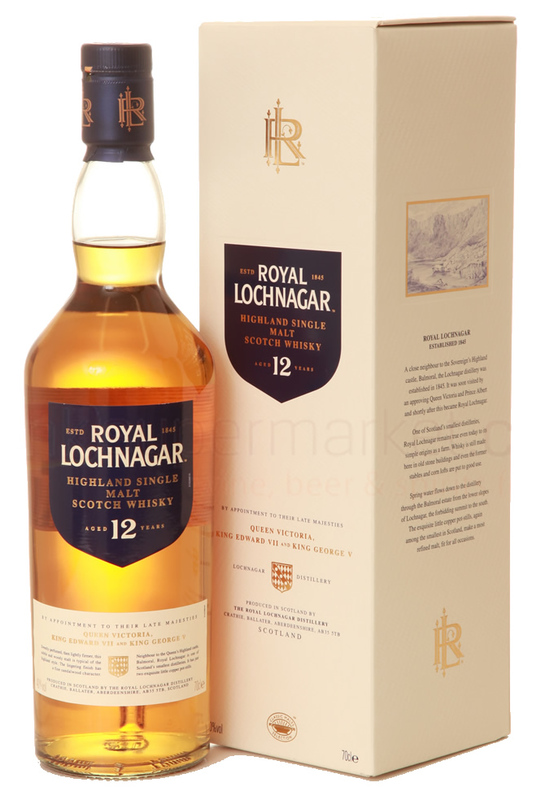 Typically a single malt like Royal Lochnagar 12 yo brings out a leathery note, which I think would combine easily with an Oriental tobacco blend. It also brings out a little peaty flavour and aroma. 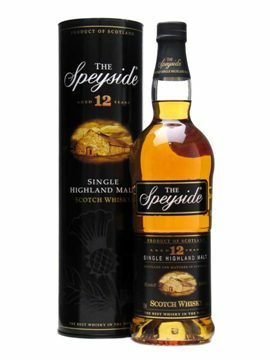 Other light to medium peated whiskies would do nice in my opinion, like Springbank 10 yo, Scapa 16 yo and Isle of Jura Superstition. I think a Virginia/Oriental tobacco blend can be perfectly combined with more complex whiskies, such as Highland Park 18 yo, Loch Lomond Old Rhosdhu 10 yo, Glen Garioch 12 yo or a Glen Spey 12 yo. Burley can give a tobacco some hint of chocolate. And in some whiskies you can find that aroma too. Bladnoch 15 yo would do fine (chocolate, orange and even a tobacco aroma can be found) or the Glencadam 15 yo. 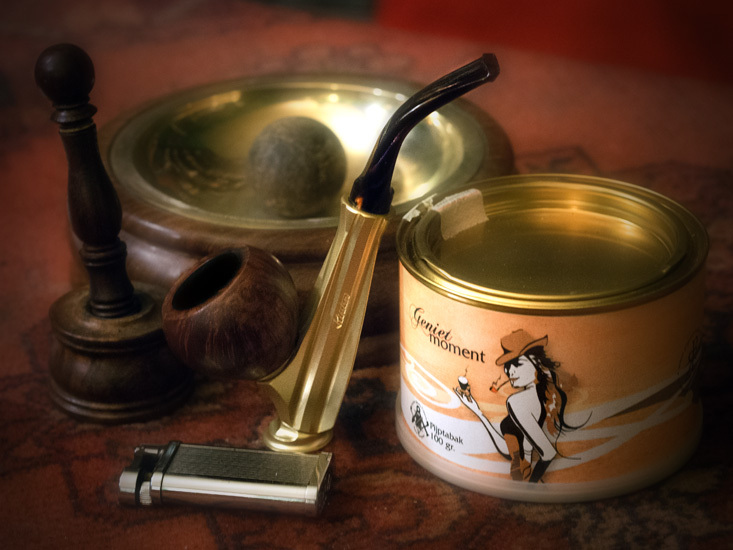 These whiskies are not too strong in taste and aroma, which combines nicely with the Virginia-based tobacco. Here too the chocolate can be found, but I think a Burley/Kentucky tobacco is often somewhat stronger in aroma and taste than a Burley/Virginia. Therefore I would recommend a whisky that is a bit more “present” in the nose and on the tongue, like Glenrothes from about 14 yo or older or a Speyside 12 yo. The latter shows even more chocolate with a few drops of water (and don’t exaggerate on the water!). Well, this is the territory of the man who get hair on their chests while smoking these kind of tobacco-blends. And mind you, there are whiskies which grow hair on your chest too: the peaty ones. 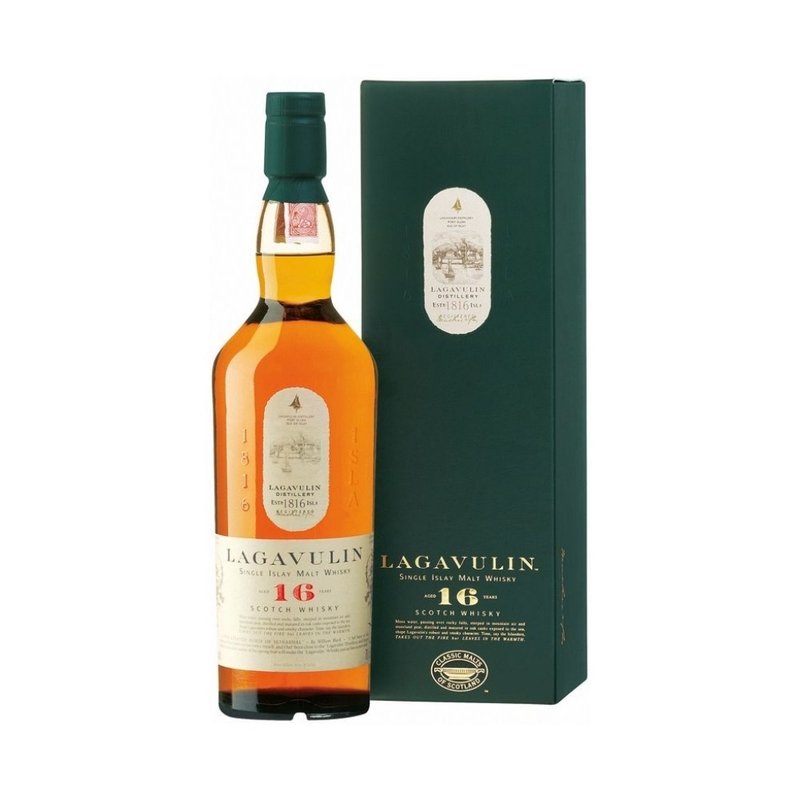 A few examples of medium to strong peated whiskies are Lagavulin, Caol Ila, Bowmore, Ardbeg, Laphroaig, Kilchoman (all from the Isle of Islay) and Longrow (the peaty one from Springbank) or Ledaig (the peaty one from Tobermory). But also some brands, less known to produce peaty whiskies, have managed to bring some nice peaty expressions. Like the Isle of Arran Devil’s Punch Bowl, Croftengea 5 yo or Inchmoan 4 yo (both from the Loch Lomond distillery) and Ardmore Fully Peated Quarter Cask finish. 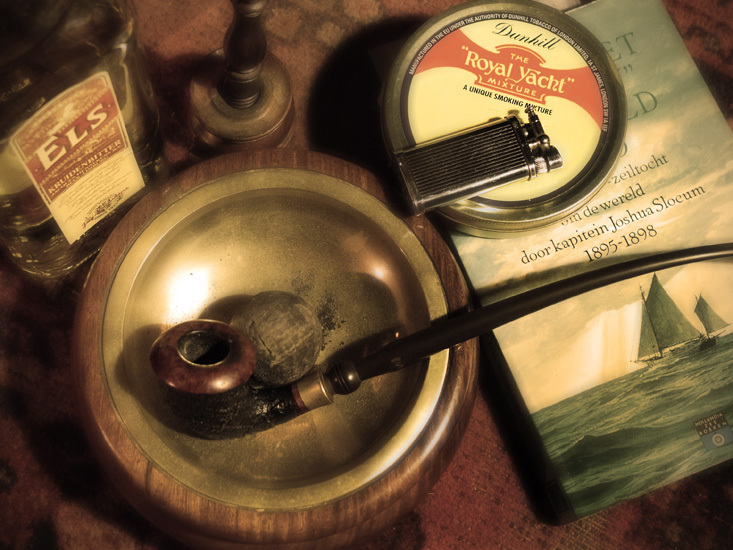 The famous Talisker from the Isle of Skye matches evenly well with a Latakia tobacco. And distilleries from the Isle of Islay that have a non-peaty house-style sometimes produce a peaty whisky. Like the Port Charlotte expression from Bruichladdich and the Moine-series from Bunnahabhain. The last one only bottled by independent bottler The Ultimate from Amersfoort, The Netherlands. With tobacco blends which include Cigar leaf I think a lot of peaty whiskies can be combined perfectly. Also whiskies with some leather-aromas would do fine (like the mentioned Royal Lochnagar 12 yo). 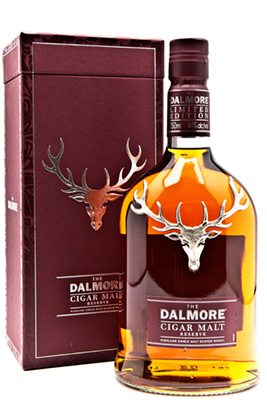 But one specific single malt comes to mind to accompany a cigar leaf pipe tobacco and of course a cigar as well: the Dalmore Cigar Malt. If you like these kind of tobaccos or you are a cigar aficionado as well as a pipesmoker and you are looking for a balanced whisky to go with the smoke, this is the best I can recommend. It balances perfectly with the smoke and even let’s behind an oily film in your mouth. 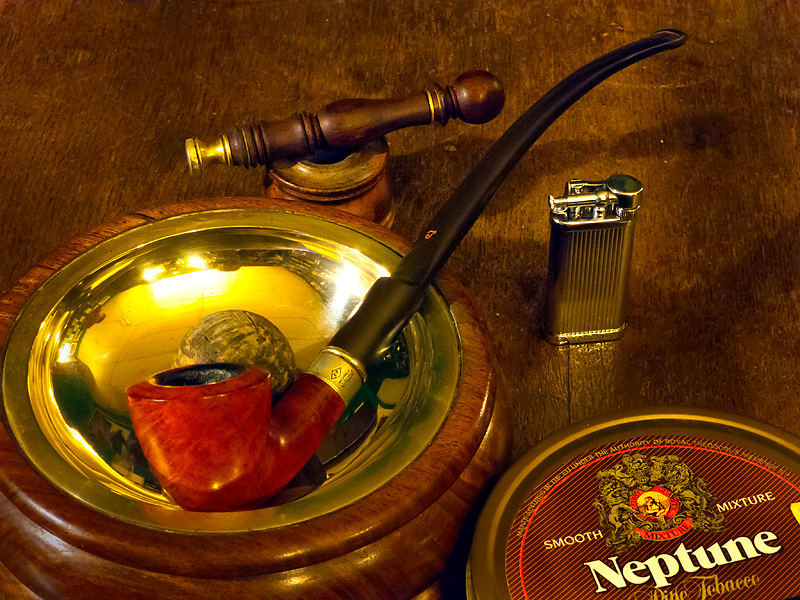 Which makes the smoke, either pipe of cigar, very pleasant. Keep in mind that maturing on ex-American whiskey casks creates whiskies with vanilla and caramel. They vary from dry to pretty sweet. 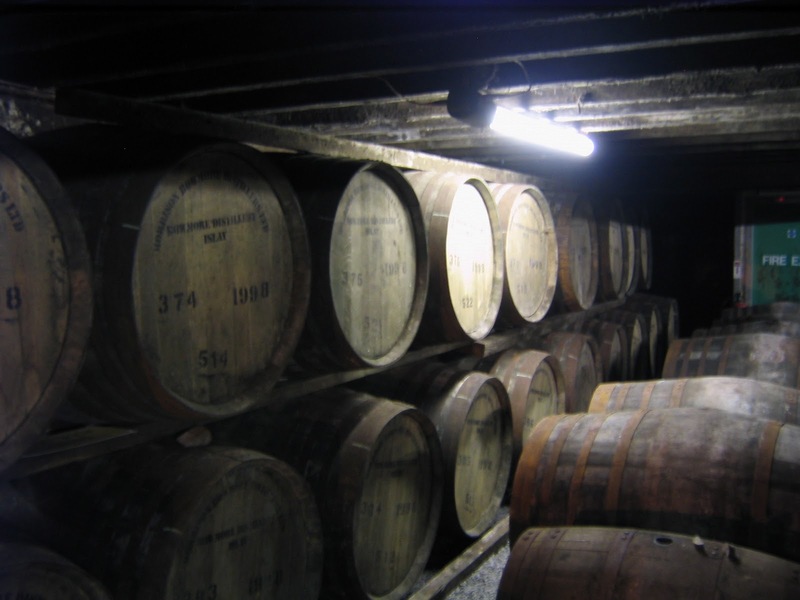 Maturing on ex-sherry casks mostly give more complex whiskies. With aromas varying from fruits, chocolate and flowers to nutty aromas and even aromas of other distillates like brandy and armagnac. In closure I would like to make a kind of statement. 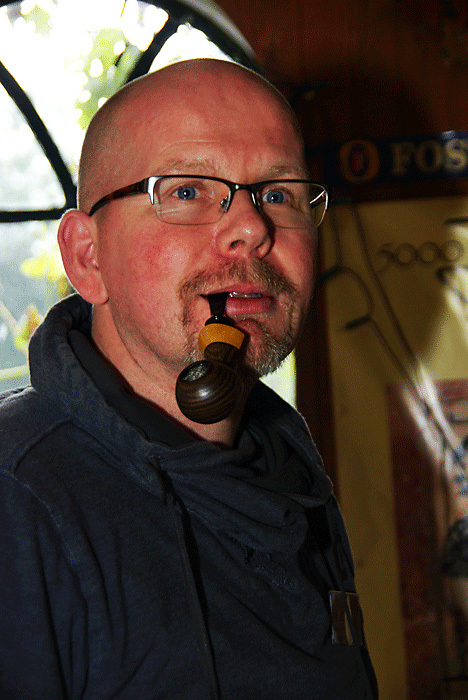 People often ask me if smoking is allowed while drinking whisky. 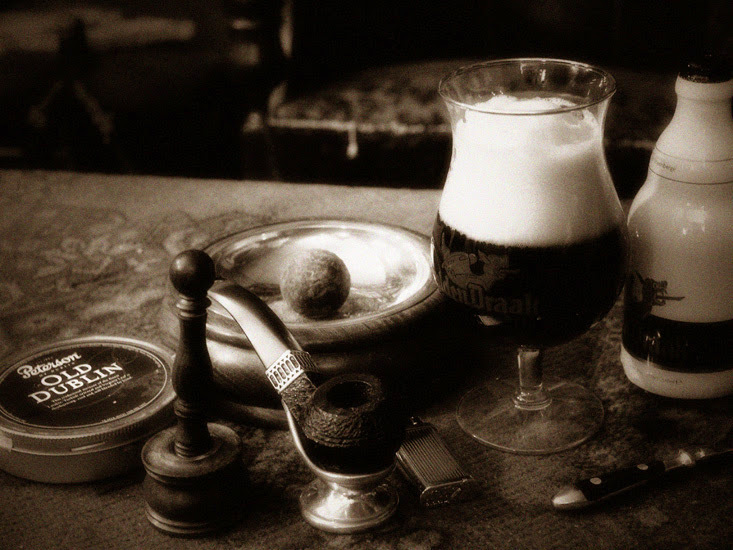 My opinion on is this: When you are drinking socially or just to relax and take some time for yourself to enjoy the good things in life, please smoke, drink and eat what you like and how you like it. 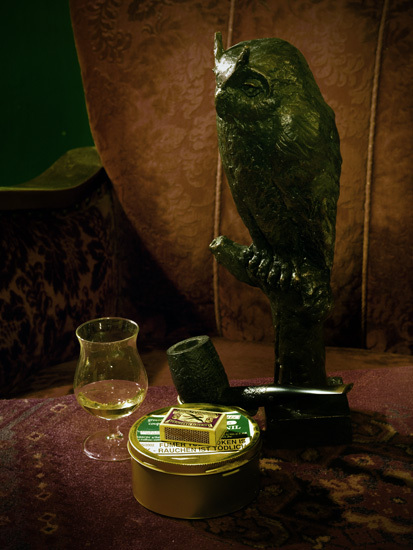 However, when you are seriously “nosing and tasting” your whisky, it’s better not to smoke. 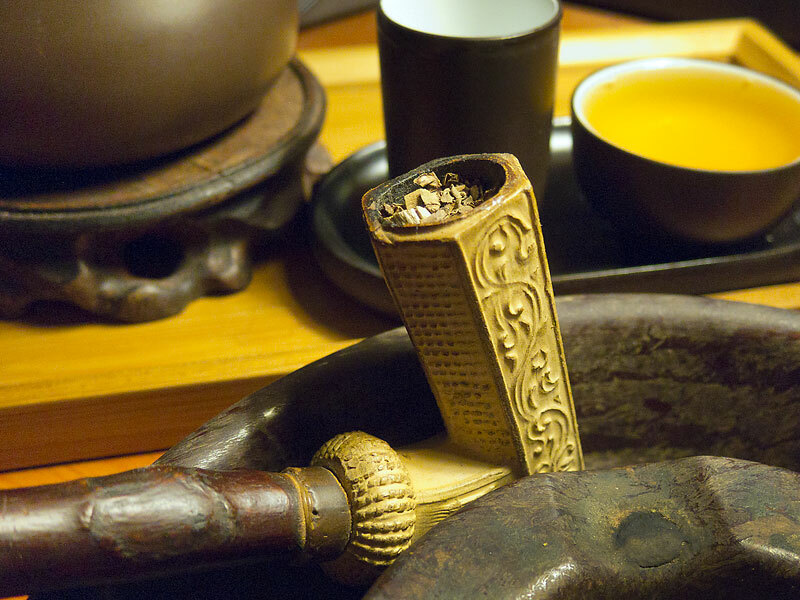 The same goes for exploring a tobacco trying to define the aroma’s which are in it: better not drink or eat while searching for the fine nuances in your mixture. The one interferes your perception and findings of the other. 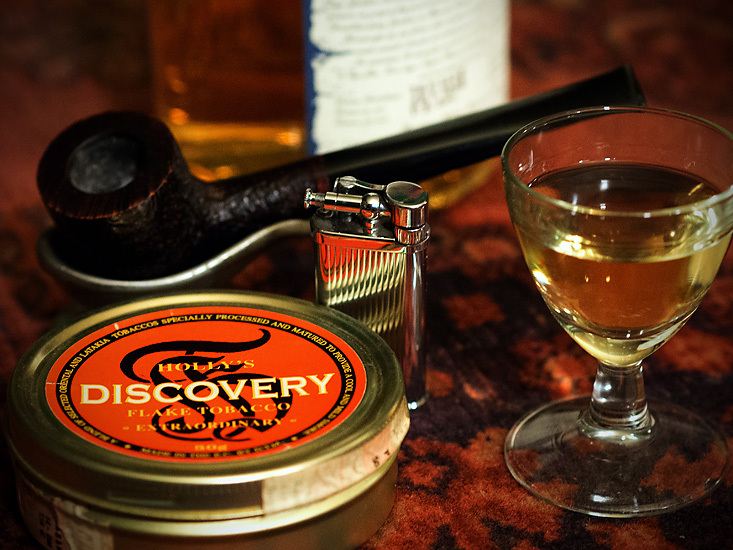 Whether you are exploring whisky while smoking or exploring your tobacco while drinking a fairly strong drink like the ” water of life”. For instance, the Scotch single malt whisky Highland Park 18yo is a very complex whisky with 24 detectable aroma’s. If you are really exploring this whisky, a smoke will have effect on your nose. Thus making it very hard searching for such fragile distinctions in whisky aroma’s. 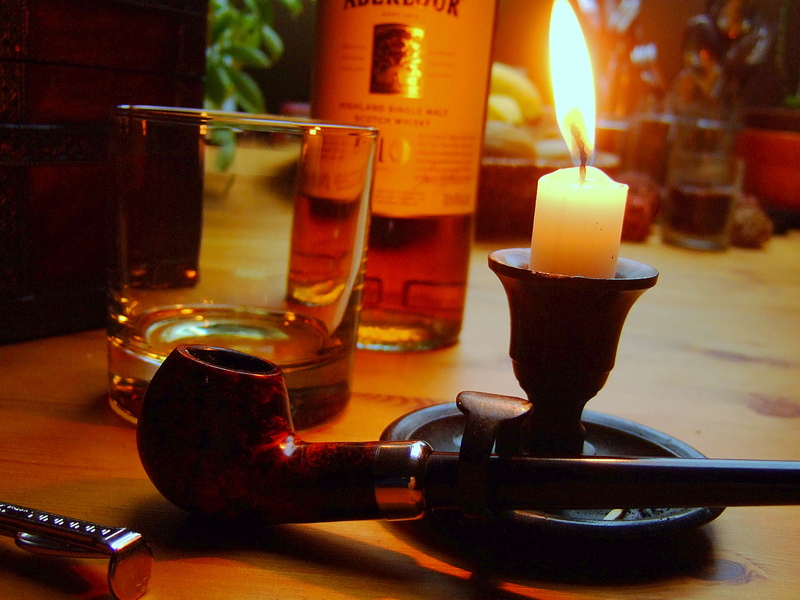 Having said this, I can assure you that I like to smoke my pipe or a good long-filler cigar while enjoying my whisky. Even my complex Highland Park 18yo, when I’m just relaxing and enjoying my passions: pipe-smoking and Scotch single malt whisky. 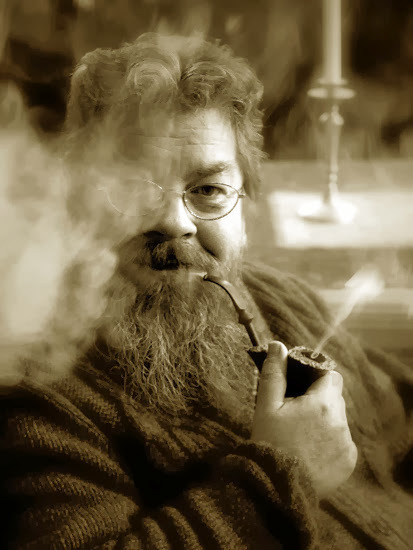 Whisky and Tobacco (by Paul) – Part 1. Once in a while, mostly late in the evening when Ellen is already asleep, I like to indulge myself with a glass of good whisky. 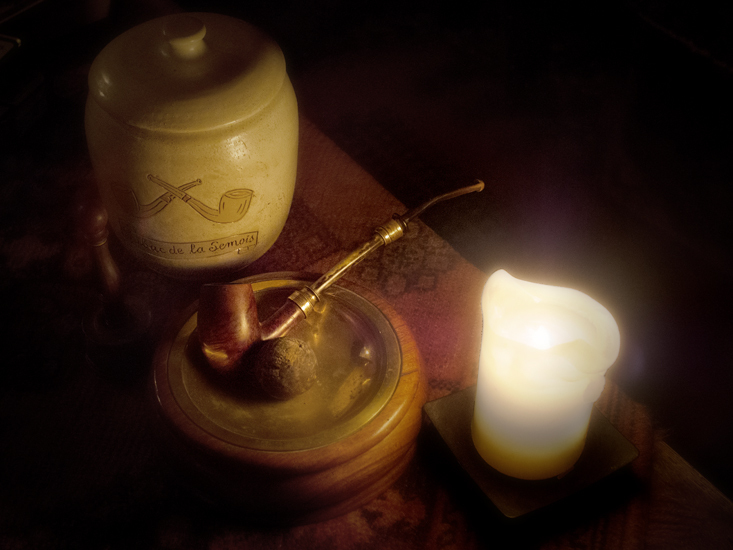 Often in combination with a pipe. Unfortunately I know very little of this distilled alcoholic beverage that is made from fermented grain mash, only that I like it. 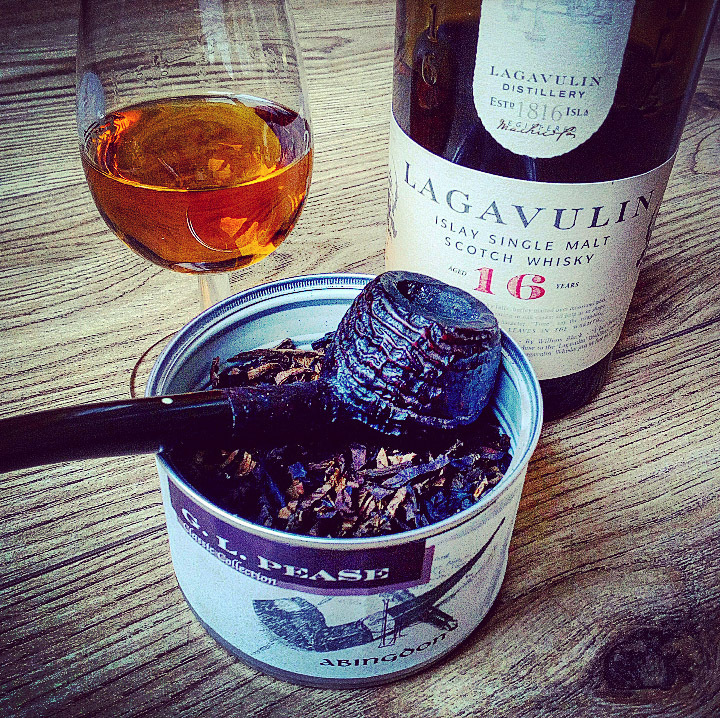 What I do know is that I enjoy a glass of peaty 16 year old Lagavulin paired with a pipe filled with leathery, smoky Penzance. Hmm.. 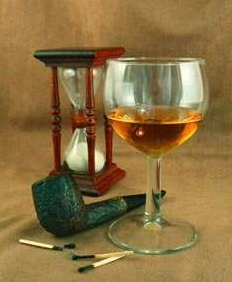 I wondered.. Would there be more combinations possible between whisky and tobacco? The man to ask this question to is Paul, who some of you may know from the “Who’s afraid of chemistry part 1 and 2” posts. 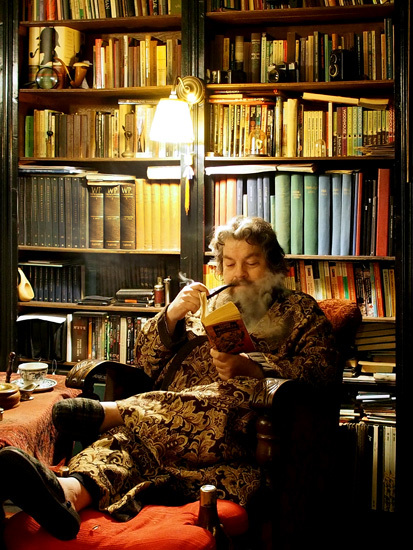 Besides pipe smoking he also enjoys a good whisky. Well, several good whiskies. Ok, a lot of good whiskies. 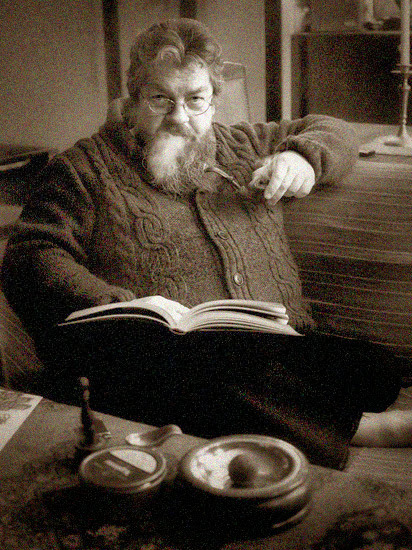 The man is a walking whisky encyclopaedia and has bottles and bottles of the finest “water of life” at home. Paul also does so called “nosings and tastings” in which, together with a selected group of people, he discusses how to distinguishing smells and tastes with whiskey. 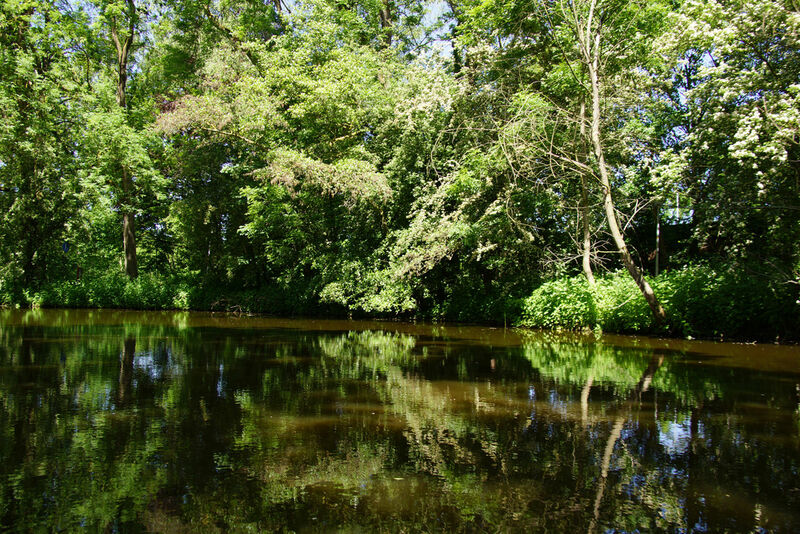 He also provides background information about the production process, the components of the distilleries, specificities of whisky, whisky regions and distilleries, wood and barrels, water and peat, boilers, other technical aspects etc. So I asked him to write a post about which whisky goes best with which tobacco. 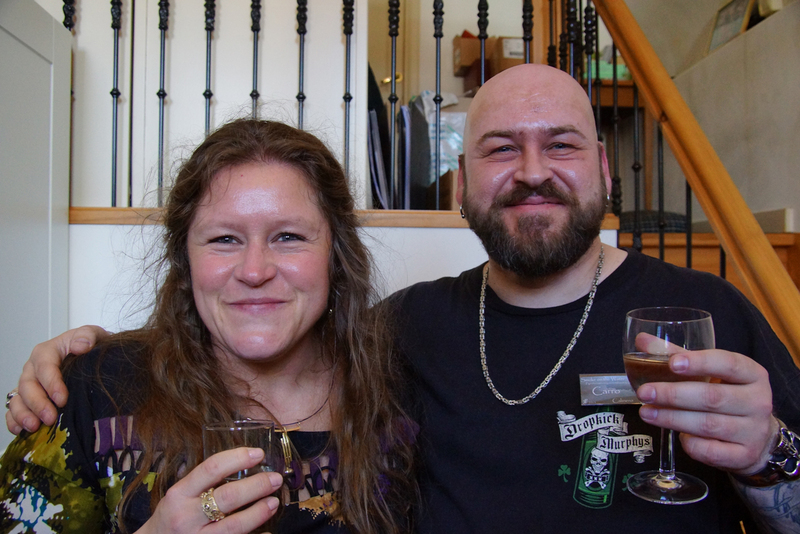 Before I let you read the piece Paul wrote I have to mention that throughout his story I linked to whisky reviews. 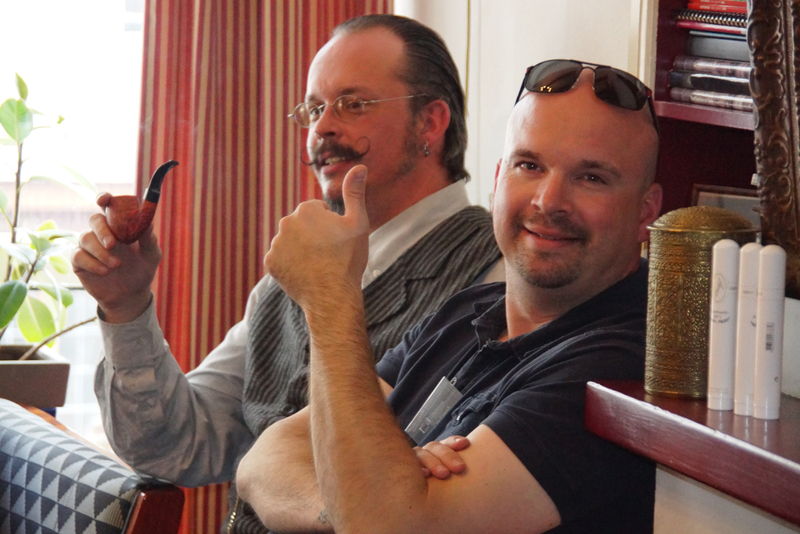 Now not every reviewer thinks the same about a whisky (the same goes for tobacco) so all opinions and recommendations are Paul’s and are based on his knowledge and vast experience. 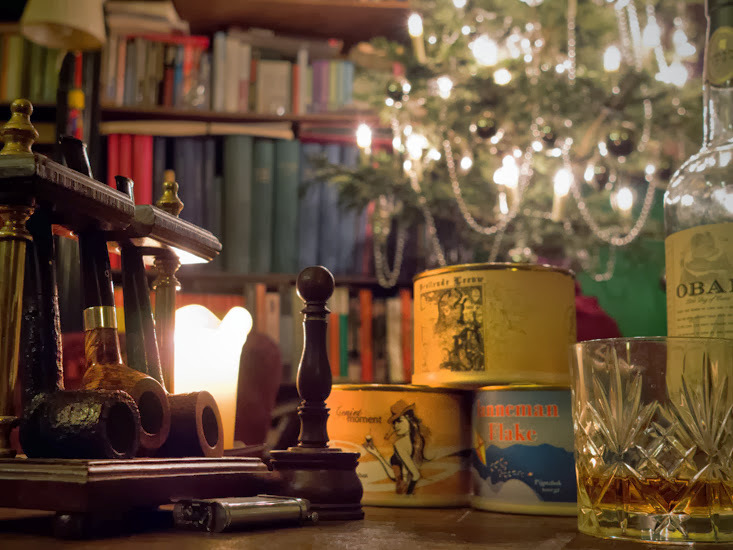 For this article I want to write a bit about one of my other passions besides pipe-smoking: whisk(e)y. Arno has asked me: which whisky goes best with which tobacco? Hmmm, tough question to answer, because one person likes to adjust the tobacco aromas with the whisky aromas and another likes some contrast in tobacco and whisky while enjoying them together. My specific love goes out to the Scotch single malt whiskies, so you will find them in my examples. But in this article I will occasionally mention the Irish and the American whiskeys too; sometimes with a specific brand-name and expression, sometimes as a group. In Scotch single malt whiskies 400 (four hundred) aromas have been found, so you will understand I can only give “some” guidance on brands and expressions. 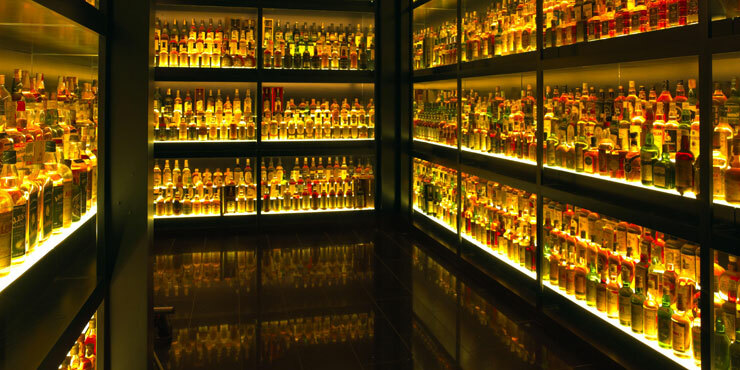 There are about 10.000 – 12.000 Scottish single malt expressions on the market, including the many independent bottlings. A list way too big to insert them all in this article. So please look upon the following tips and names as a first direction you can follow. For specific questions I will gladly be of service to answer anything on the subject of whisk(e)y. 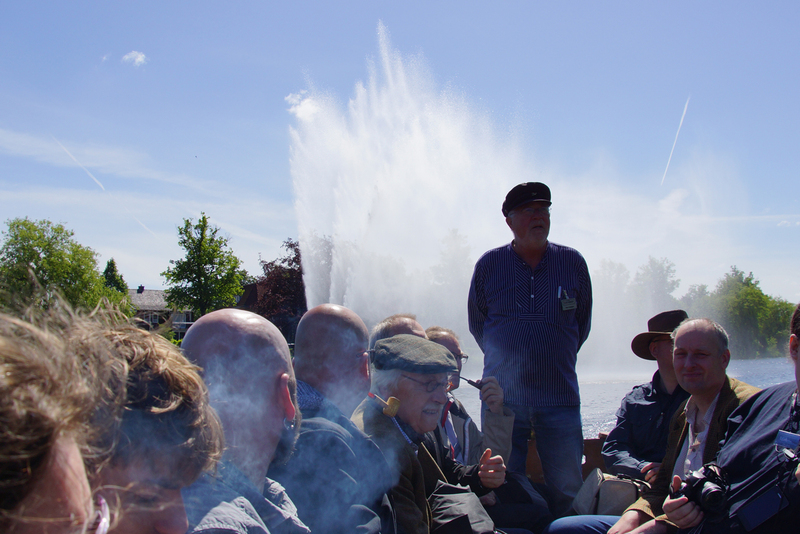 You can use the e-mail on my website www.whiskyinfoplus.nl (in Dutch, but you will find the e-mail button). 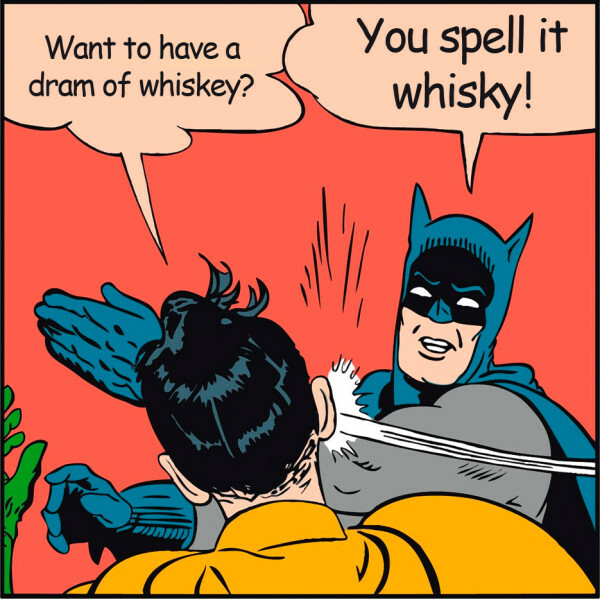 Well, this is not entirely true Batman..
For the purists on this heavenly brew, who might have noticed the “e” in the name of the drink: Irish and American whiskey is written with the “e” in the name, all the other whisky producing countries spell it without the “e”. If generally mentioned I will write whisky in this article as the Scots do. If I mean specific Irish or American whiskey, you will notice the extra “e”. A final remark upfront: “yo” is not only a rap-word from guys like 50-Cents and others, but stands for “years old”, which is the age statement of the whiskies ageing in the casks. Most American Bourbon and Tennessee whiskeys have quite some vanilla/caramel aromas, which go perfectly with a vanilla flavoured tobacco. 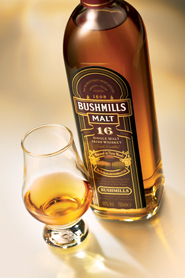 As do a lot of Irish whiskeys, such as Bushmills 16 yo, Magilligan 5 yo, Greenore 8 yo and Redbreast 12 yo. Most Scotch single malts have aged in ex-Bourbon or ex-Tennessee casks and they almost always have aromas like vanilla, caramel and/or butterscotch. Like Glengoyne 12 yo, lots of The Macallan expressions, Deanston 12 yo, The Glenlivet and Glenfiddich single malts up to 15 yo. This also goes for most of the brands from the Speyside region, as long as they have matured on casks formerly used by American whiskey makers. A lot of whiskies can have some honey aromas, i.e. 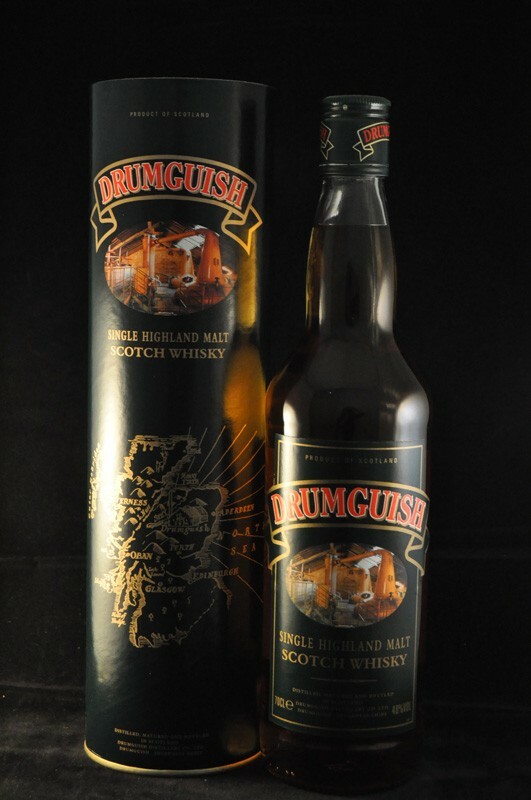 Drumguish (from the Speyside distillery, no age statement on the label), Speyburn Solera (which combines the honey with oranges) or The Macallan Fine Oak 10 yo. 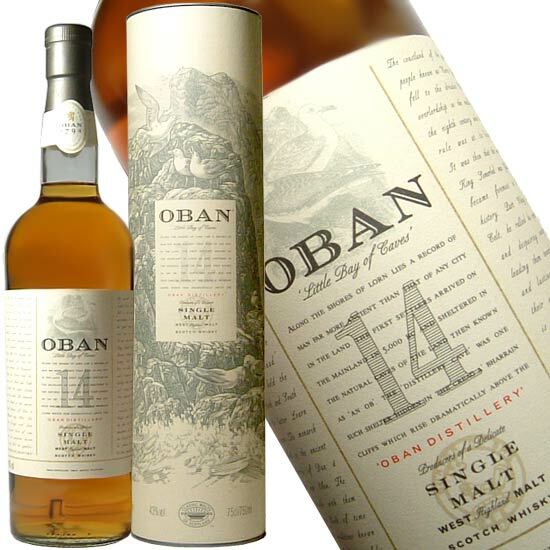 An aroma which also can be found in Scotch single malts, like Oban 14 yo, Speyburn Solera, Old Pulteney 12 yo (grape/orange like aroma) and Fettercairn Fior. 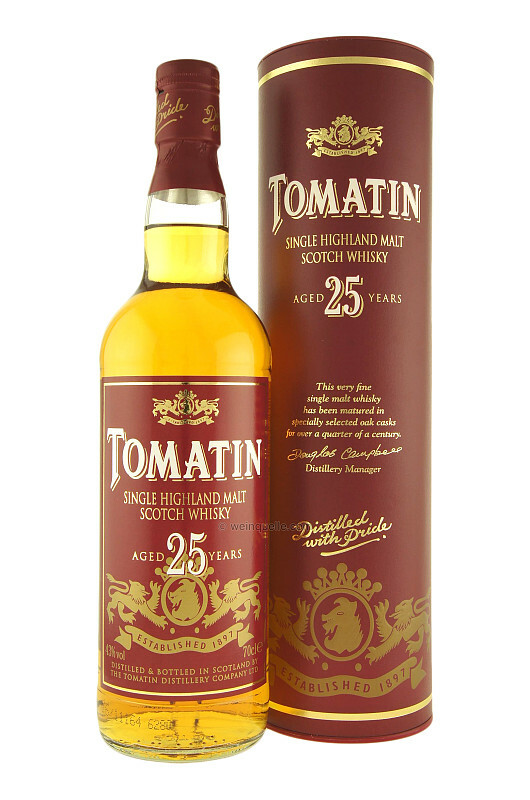 Tomatin 25 yo has a few expressions with berry-aromas. Further you have Springbank 13 yo Port Cask, Lochside 10 yo and Glencadam 15 yo. 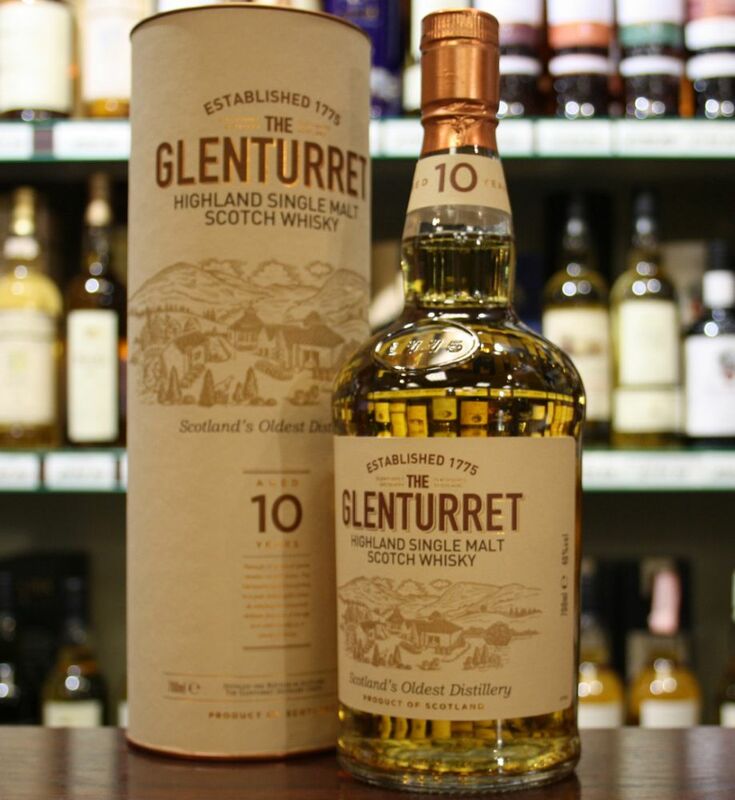 Glenturret 10 yo brings out some floral notes, as well as a lot of whiskies which have matured on ex-sherry casks, like Glengoyne, Genfarclas 15 yo, Mannochmore 12 yo, Glenmorangie Lasanta 12 yo, Benriach 12 yo, Aberlour 12 yo and most whiskies which boast “matured in Oloroso/sherry/Pedro Ximenez casks” on the label. 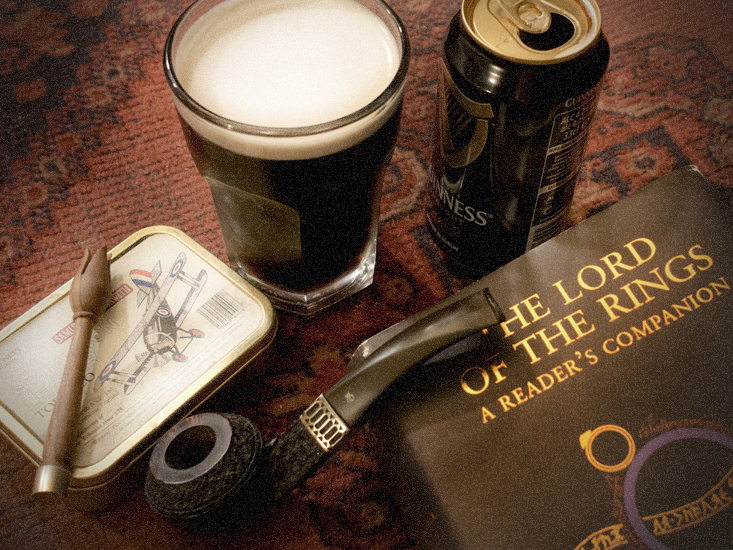 Almost all of the time an Irish whiskey matches perfectly with Virginia tobacco. There are far over 100 Irish whiskeys, blends, single malts, single grains, pot stilled or continuously distilled whiskeys. All with their own specific character but mostly a bit more “friendly & easy-going” in taste and aroma than the average Scotch single malt. 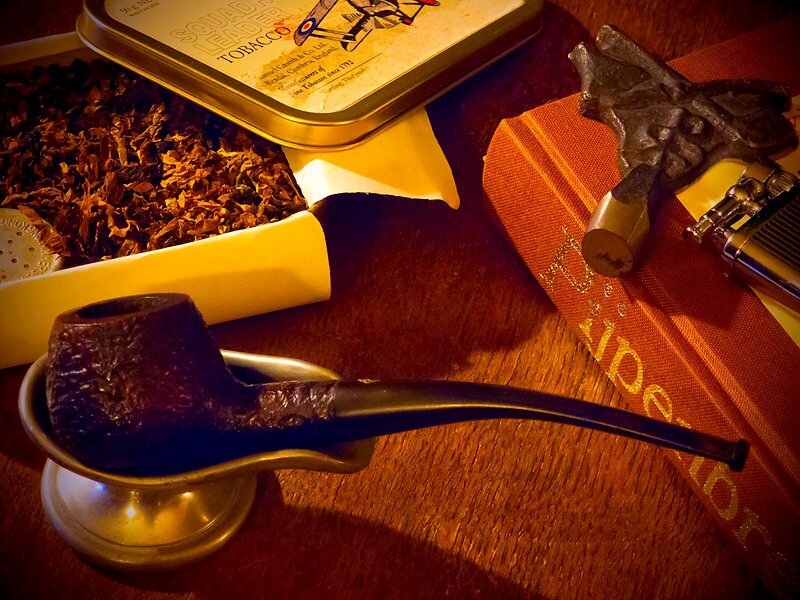 You almost can’t go wrong combining a Virginia tobacco filled pipe with an Irish whiskey. 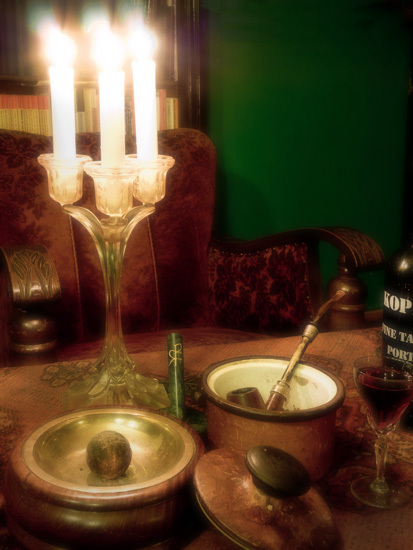 Scotch whiskies from the Lowlands also combine fine with the light sweet aroma of a lot of Virginia tobaccos. 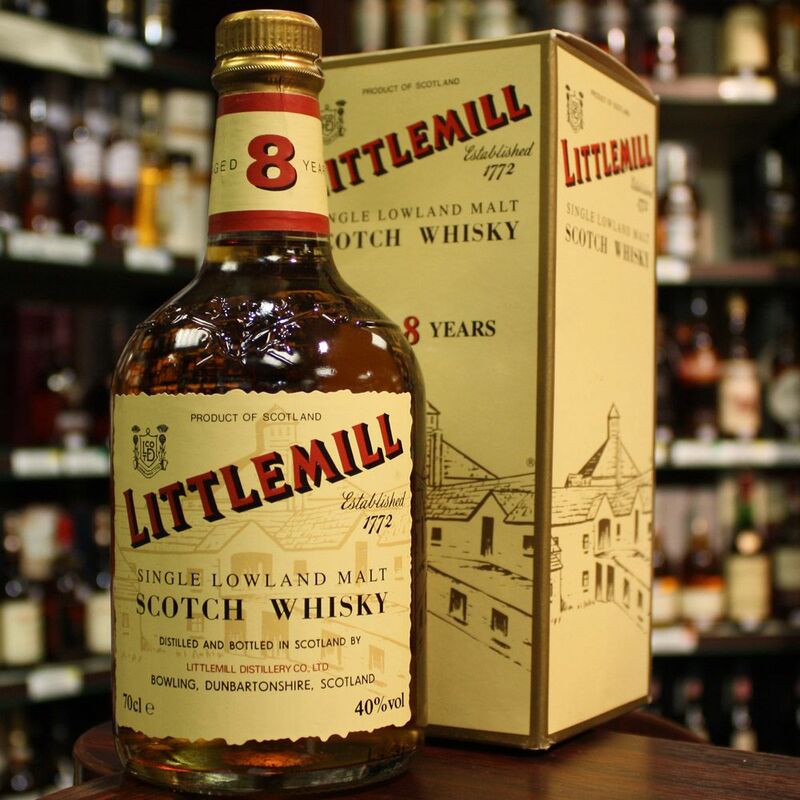 Think of Lowland whiskies like Auchentoshan 12 yo, Littlemill (if you still can find it, the Littlemill 8 yo has a typical aroma of a freshly mowed lawn), Bladnoch and Glenkinchie. But a Speyside region whisky like Knockdhu 12 yo or a young (under 15 yo) Knockando will do just fine as well. 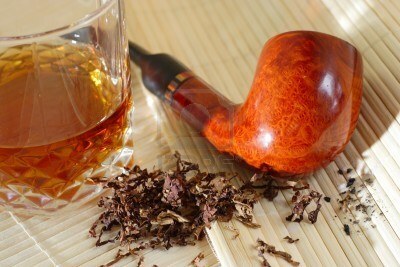 Ever tried Highland whiskies like Deanston 12 yo or Dalwhinnie 15 yo to go with your Virginia tobacco? 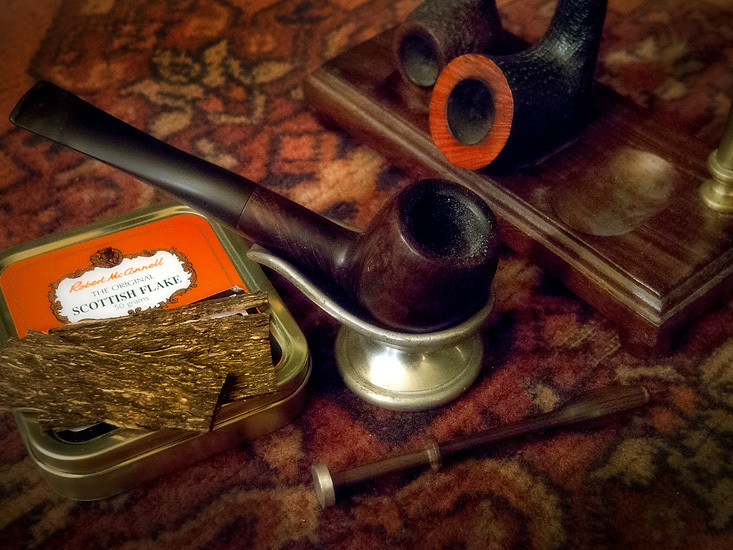 Both, with their heathery and sweet notes, will bring out the sweetness of your Virginia pipe tobacco.